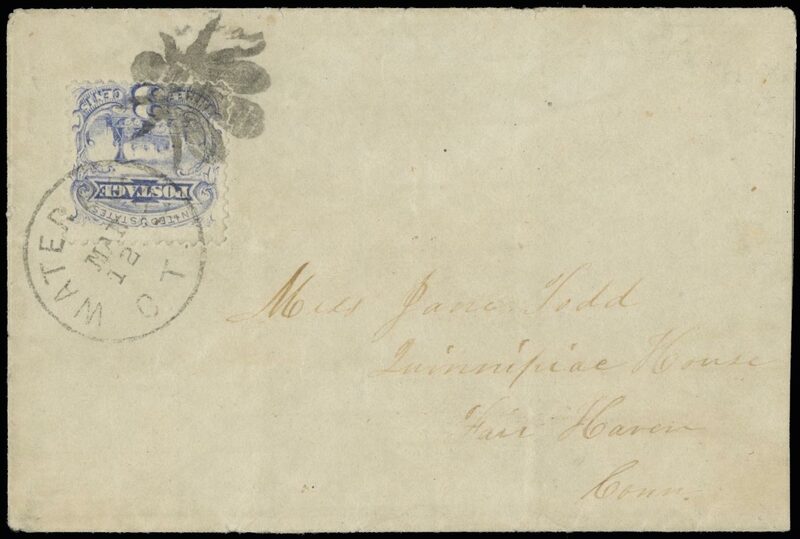 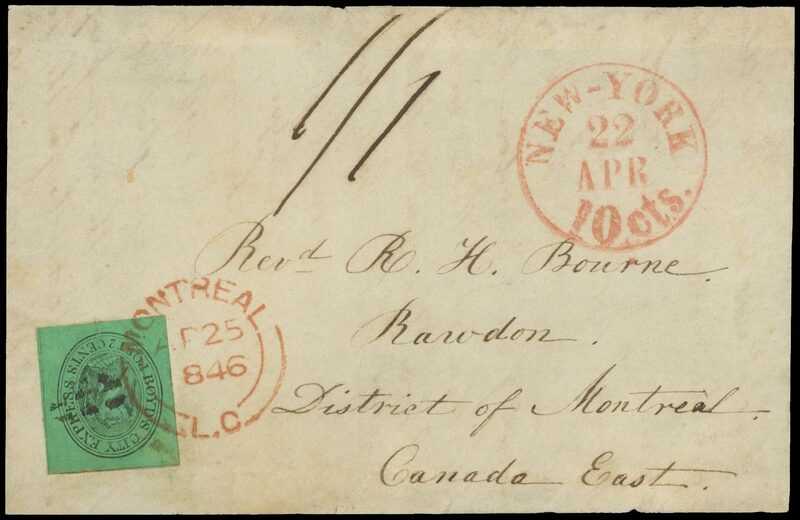 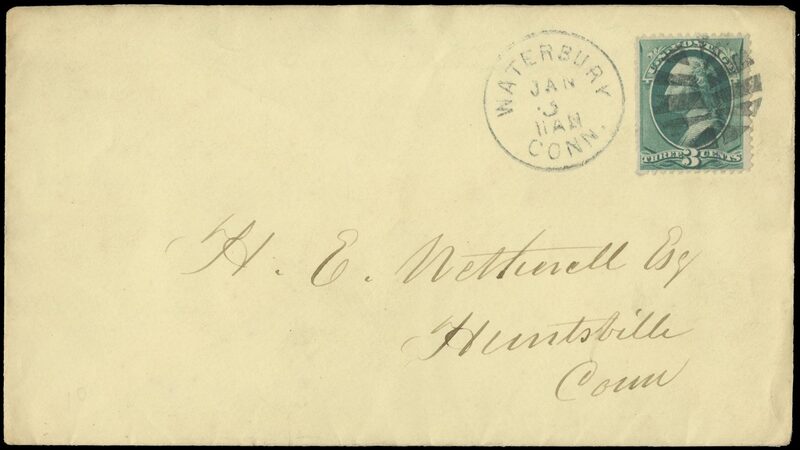 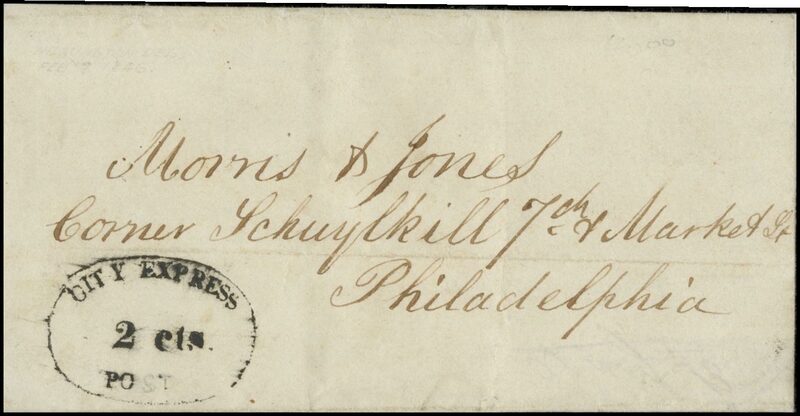 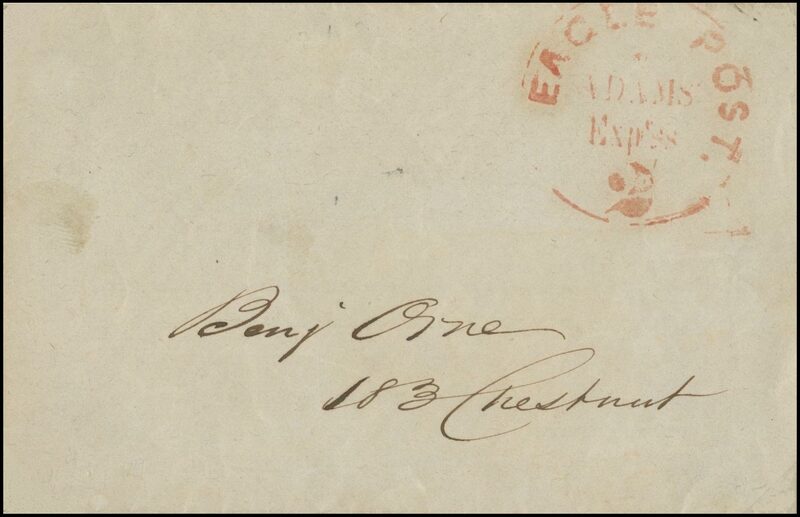 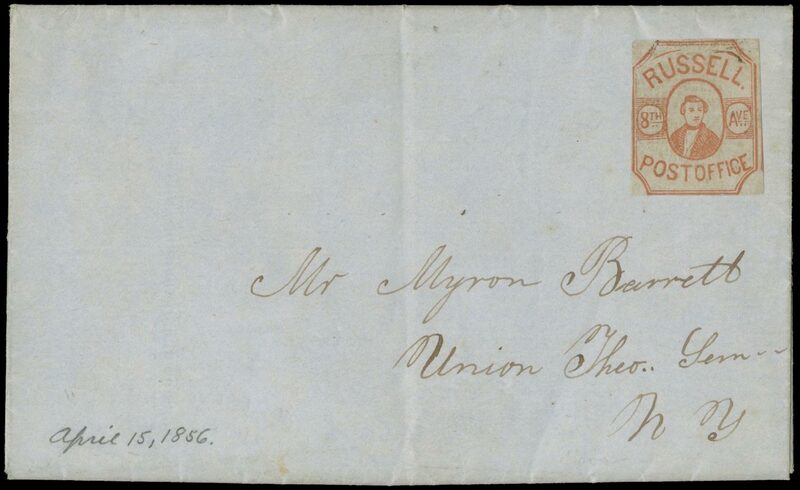 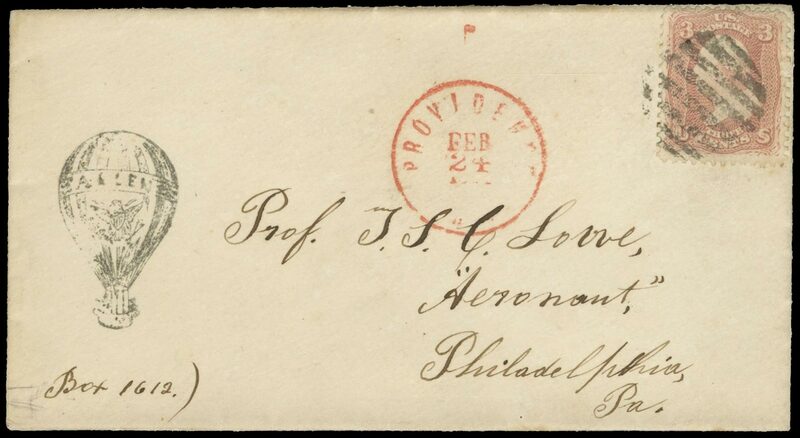 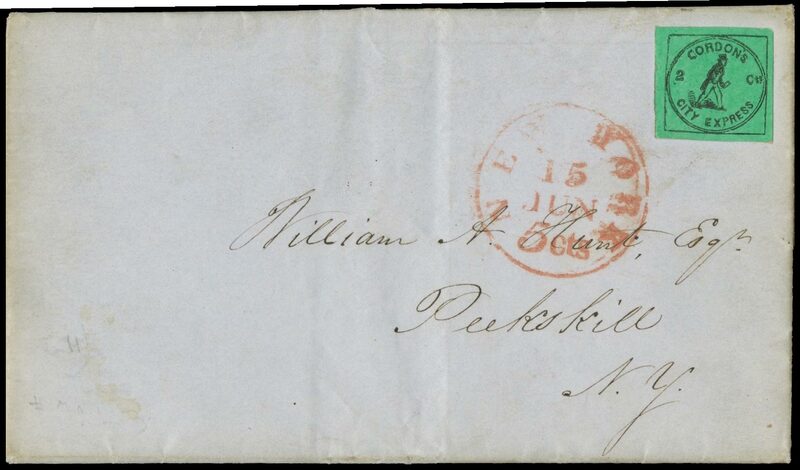 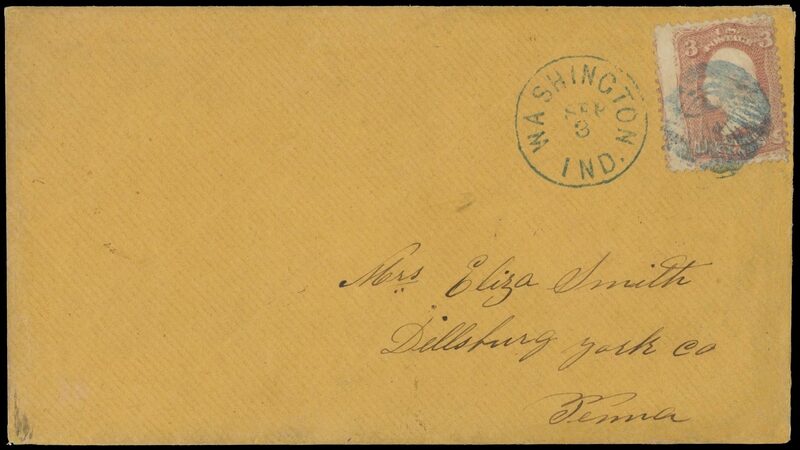 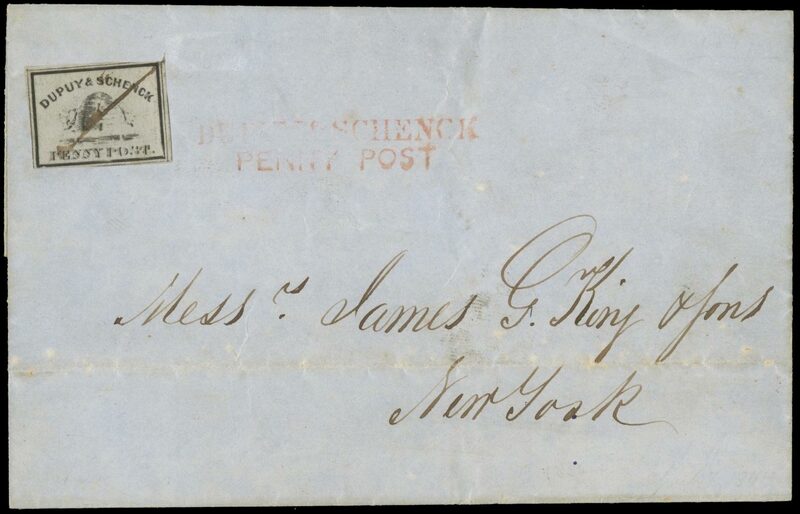 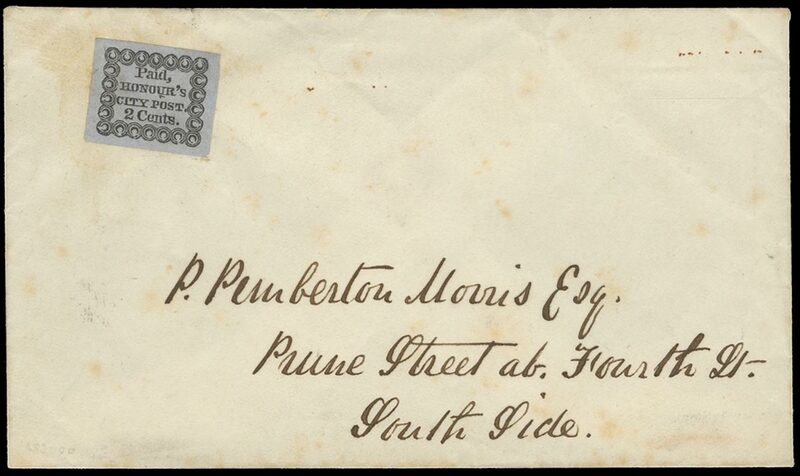 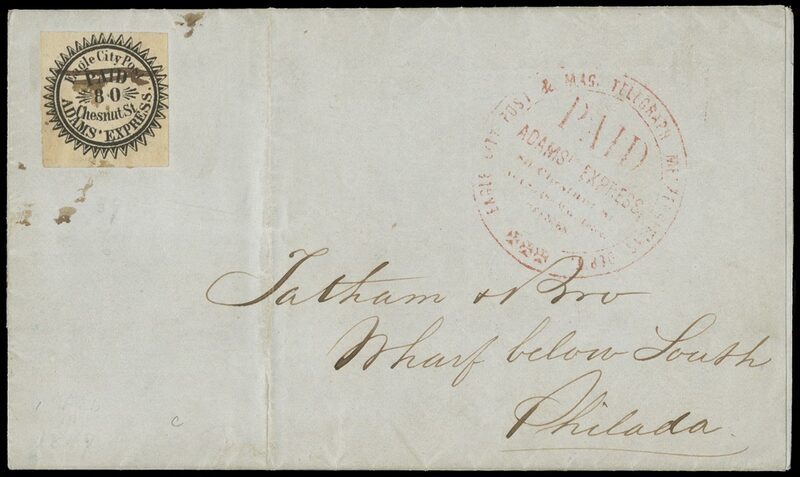 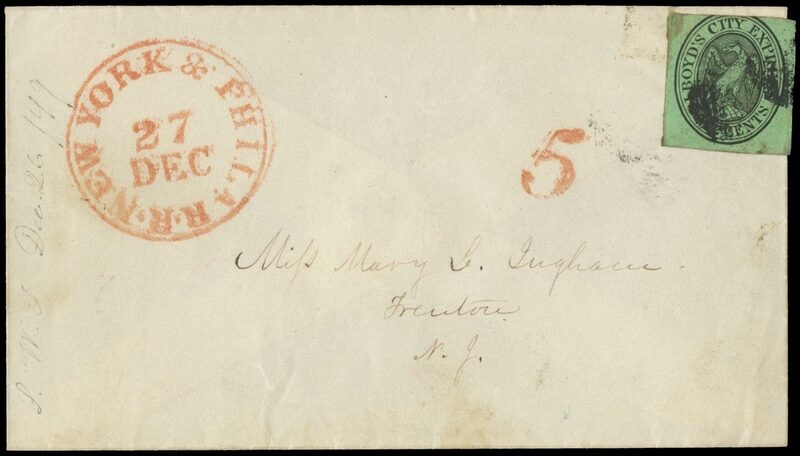 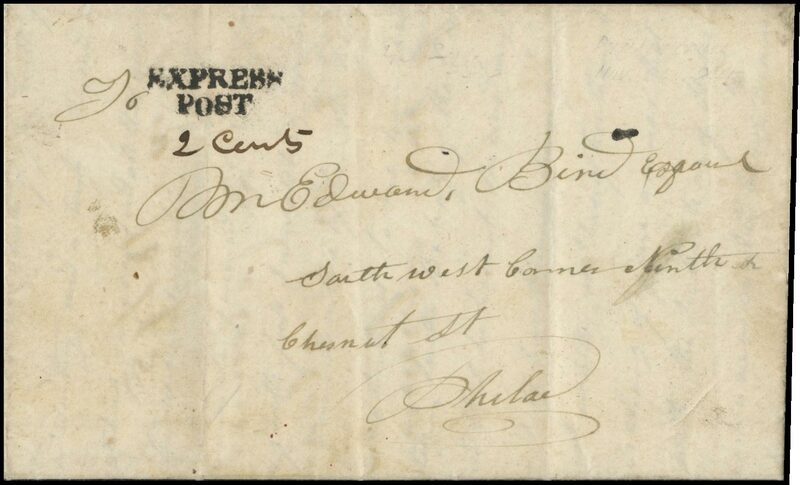 (Philadelphia) EXPRESS POST two line handstamp on locally used Nov. 26, 1845 folded letter addressed to Philadelphia, ms. «To» before marking and «2 Cents» below marking. 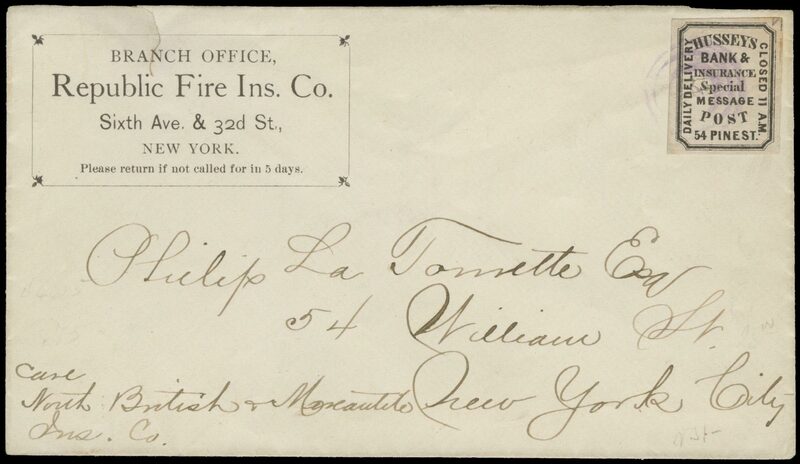 Extremely Fine use. 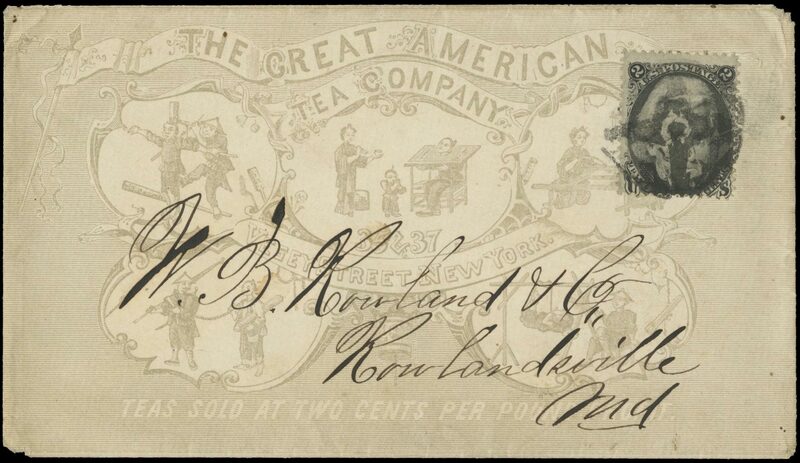 Ex- George B. Sloane, Frank Hollowbush; rnThis marking is attributed to Calvin Tyson (by Robson Lowe) and the company was supposedly sold to D. O. 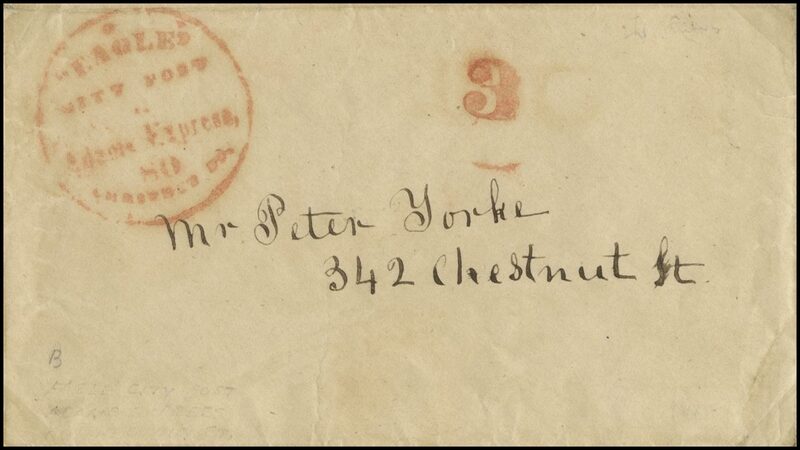 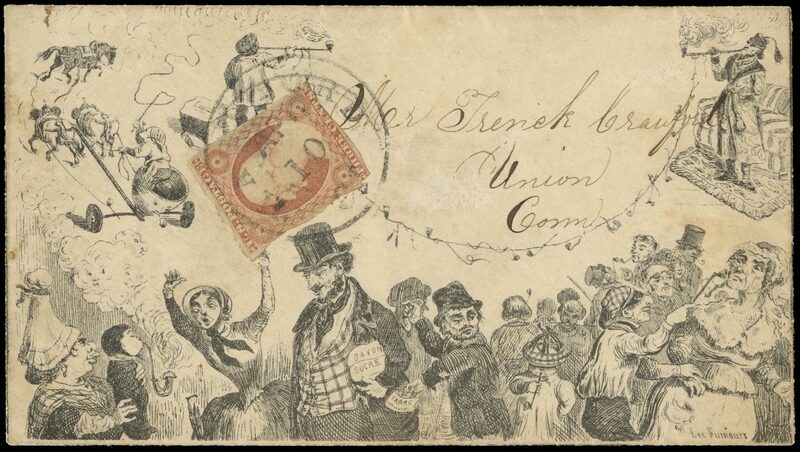 Blood on November 24, 1846 (2 days before this letter was mailed). 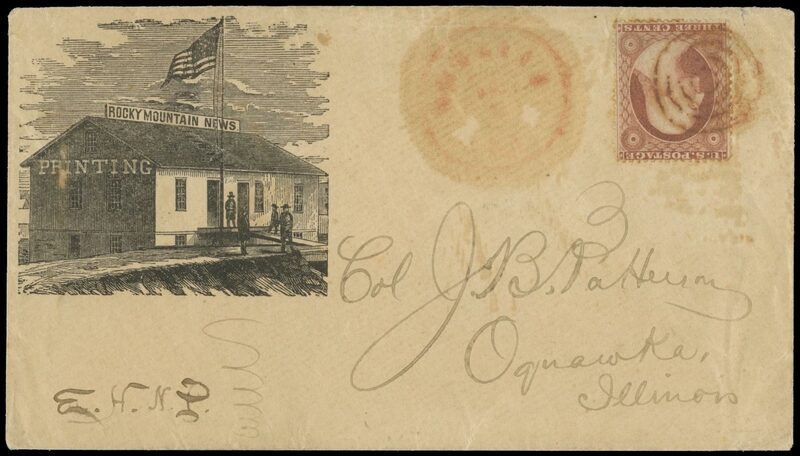 The top portion of this cover is illustrated in Volume II of the 1997 edition of the American Stampless Cover Catalogue on page 69. 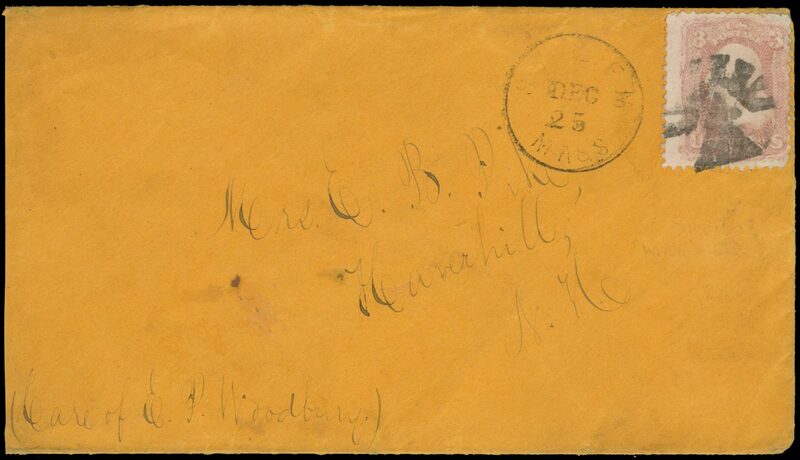 CARSON VALLEY U. T. DEC 25 legible strike on buff cover addressed to "Genl. 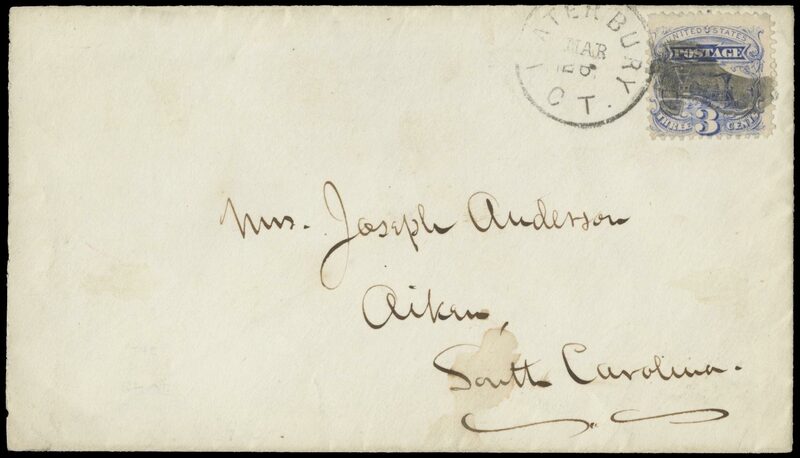 Jas. 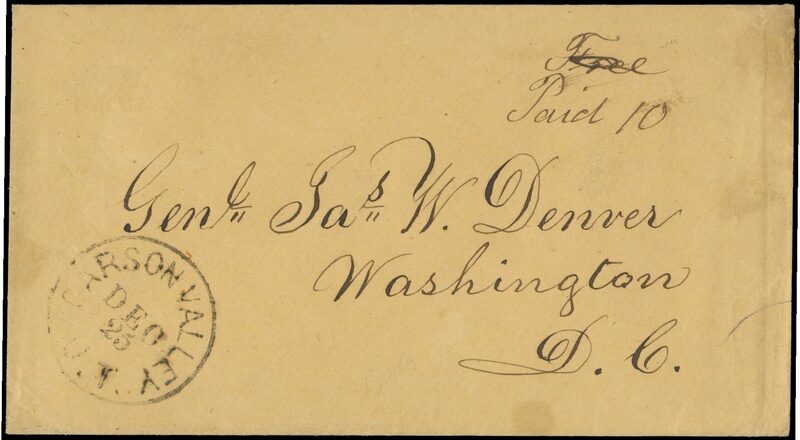 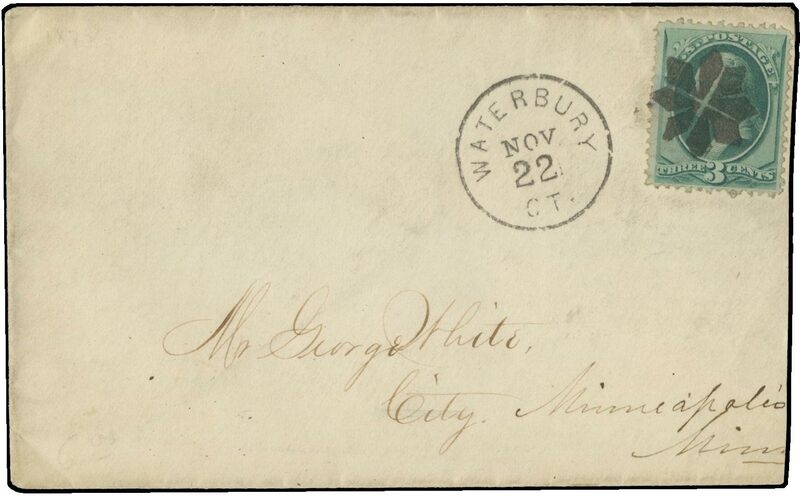 W. Denver, Washington, D.C.", ms. «Paid 10» and «Free» (crossed out) at upper right; Very Fine and scarce cover; Stanley B. Ashbrook»s notes on the reverse speculate that this was probably mailed in 1855 when Denver was in Congress and notes that a «tracing of this post mark shown in Ashbrook Vol. 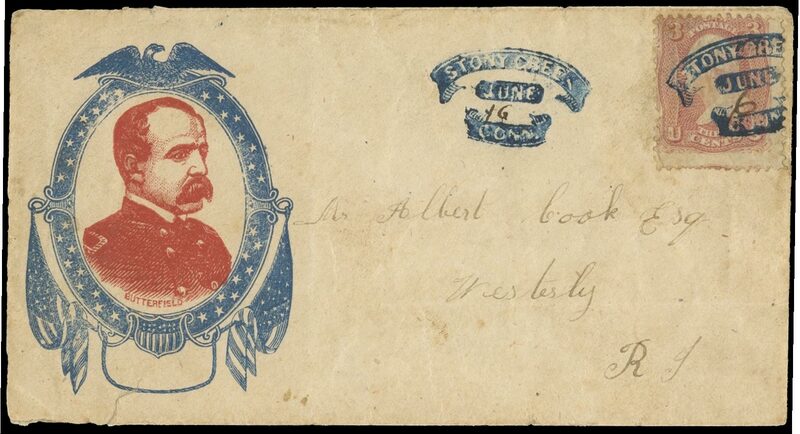 2 p. 319»; (The 1997 edition of the American Stampless Cover Catalogue placed a value of $2,000 on this marking) rnJames William "Jim" Denver (1817 - 1892) was an American politician, soldier and lawyer. 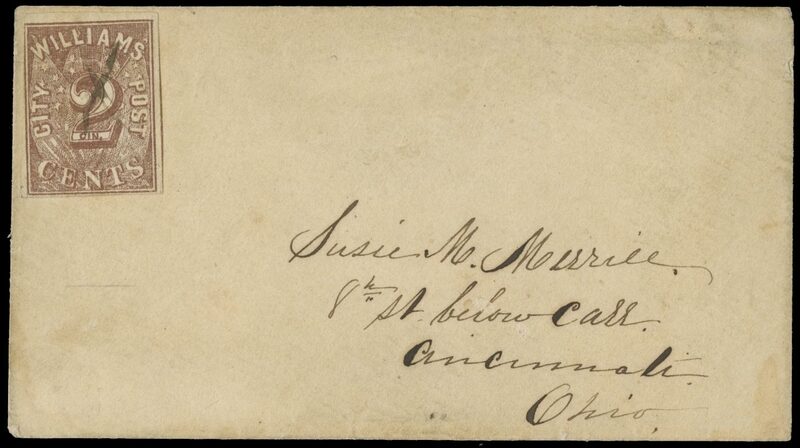 He served in the California state government, as an officer in the United States Army in two wars, and as a Democratic member of the United States House of Representatives from California from 1855-57. 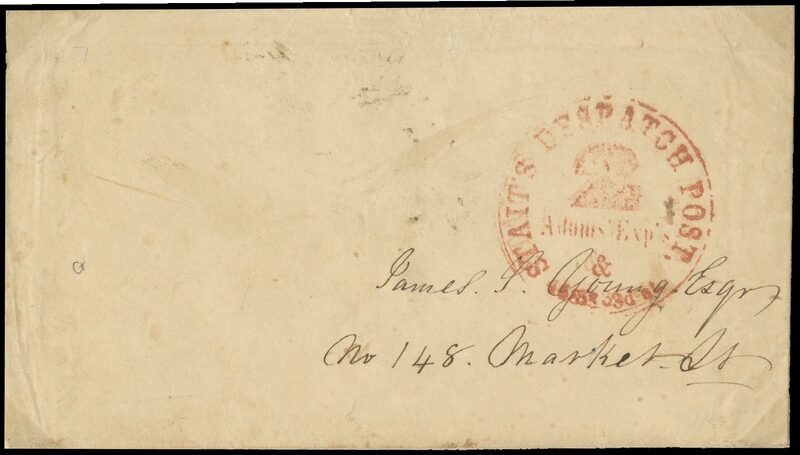 He served as secretary and Governor of the Kansas Territory during the struggle over whether or not Kansas would be open to slavery. 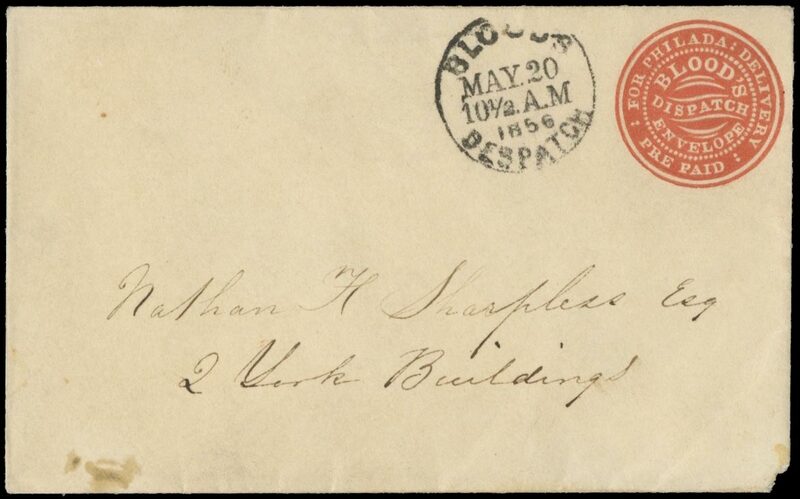 The city of Denver, Colorado, is named after him. 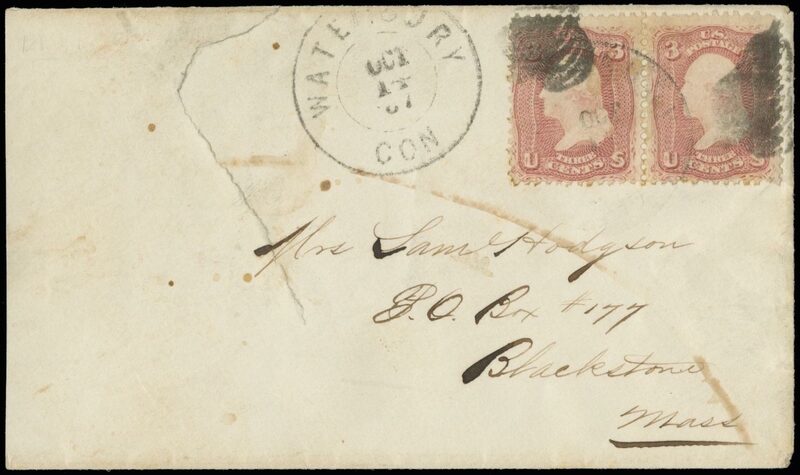 Rocky Mountain News, Printing black illustrated ad cover franked with 3c Dull red type III (Scott 26) tied by red target cancel, matching oily illegible date stamp which may read Boulder C. T. (Colorado Territory). 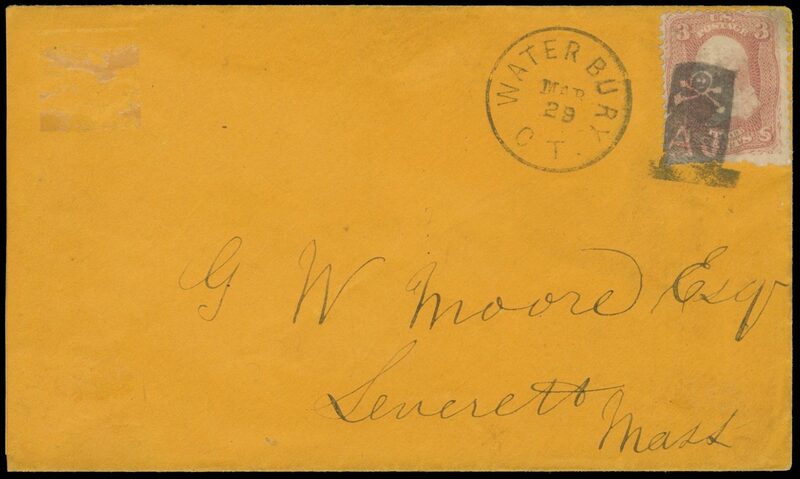 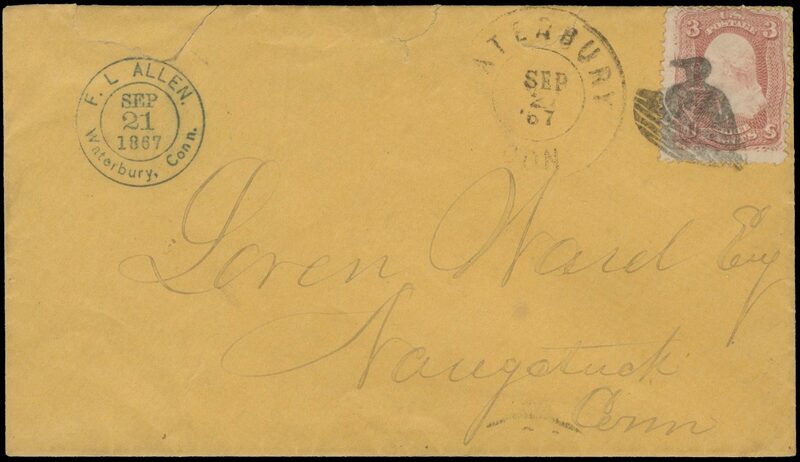 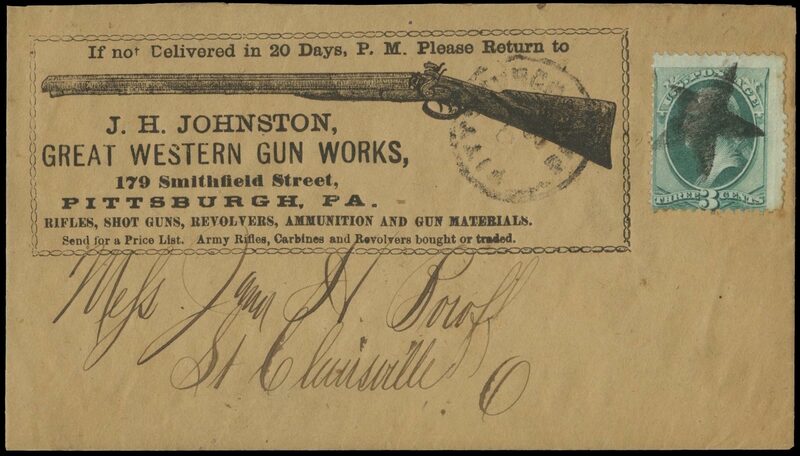 an extremely scarce cover and a Fine usernThere is a similar cover to the same addressee illustrated in Jarrett»s Colorado Territorial and Pre-Territorial Postmarks on page 130. 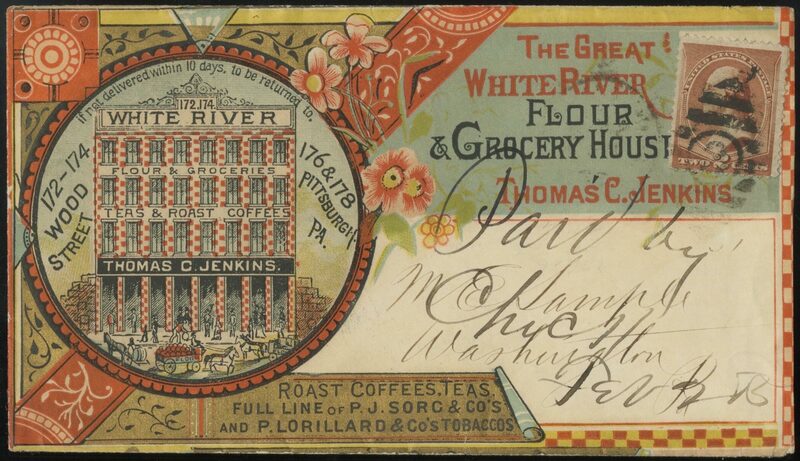 The building illustrated on this cover was situated in Denver and washed away in 1864. 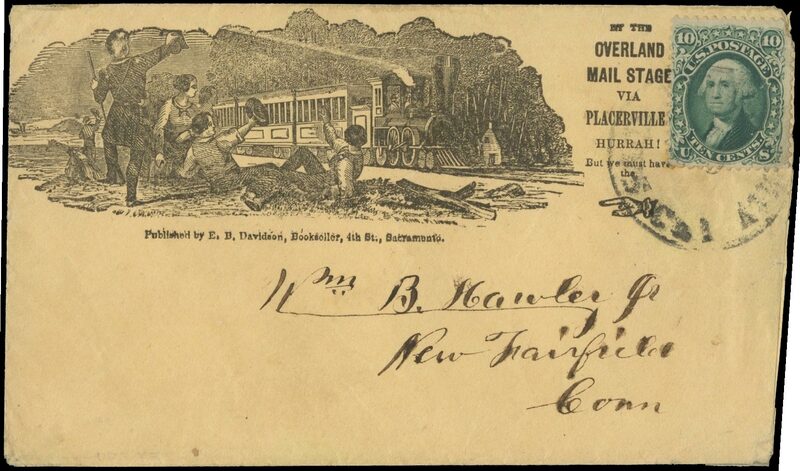 By The Overland Mail Stage via Placerville, Hurrah! 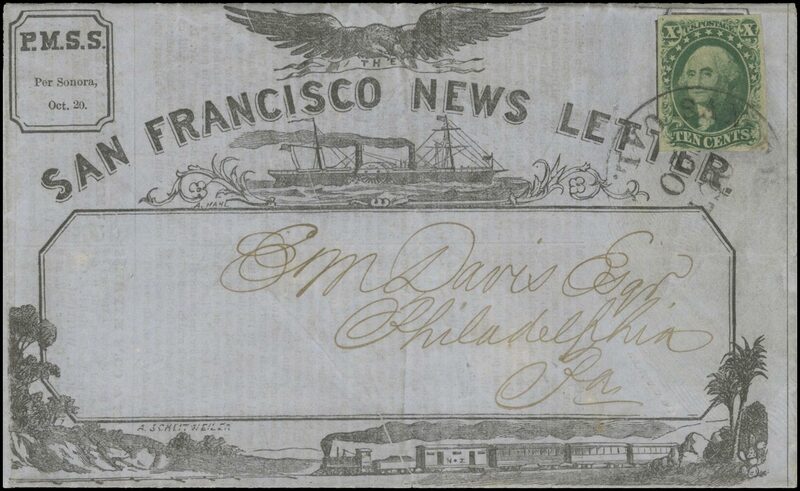 railroad propaganda cover (D»Alessandris type D-1 with Davidson imprint) franked with 10c Green (Scott 68, small creases and impression from date stamp) tied by Sacramento City Cal. 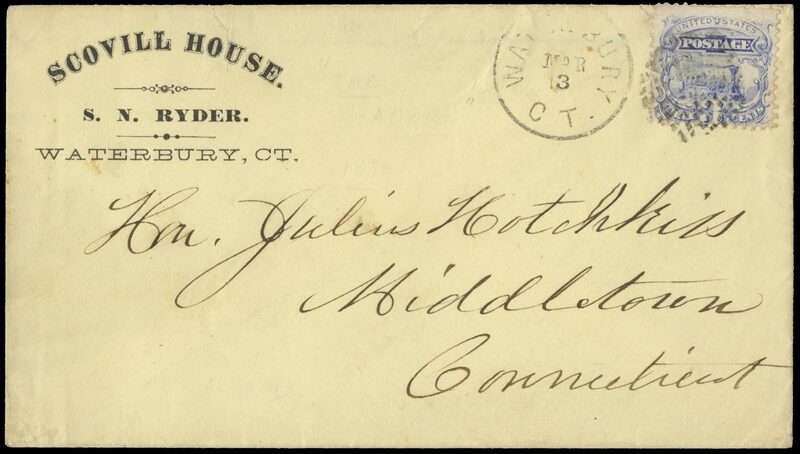 postmark, addressed to New Fairfield, Conn, cover with trivial edge flaws at right. 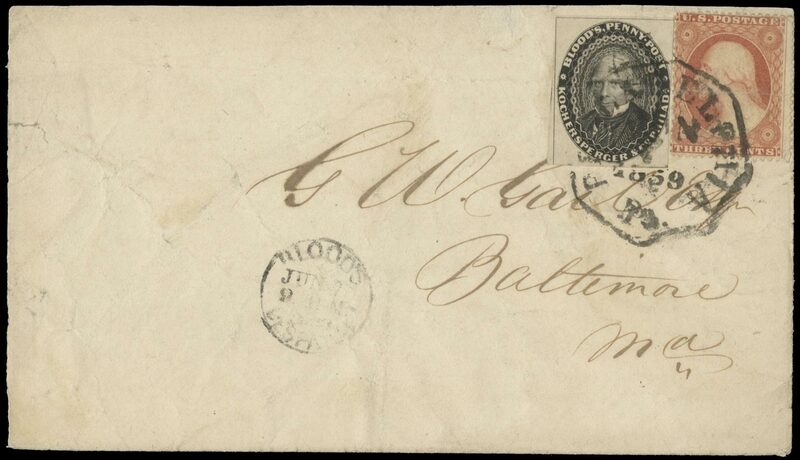 Very Fine and extremely scarce; unlisted in the D»Alessandris census which lists three covers in this style, this becoming the fourth. 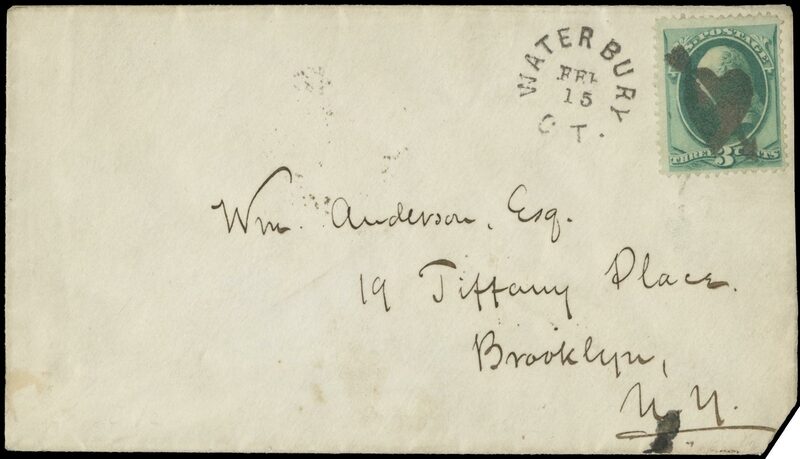 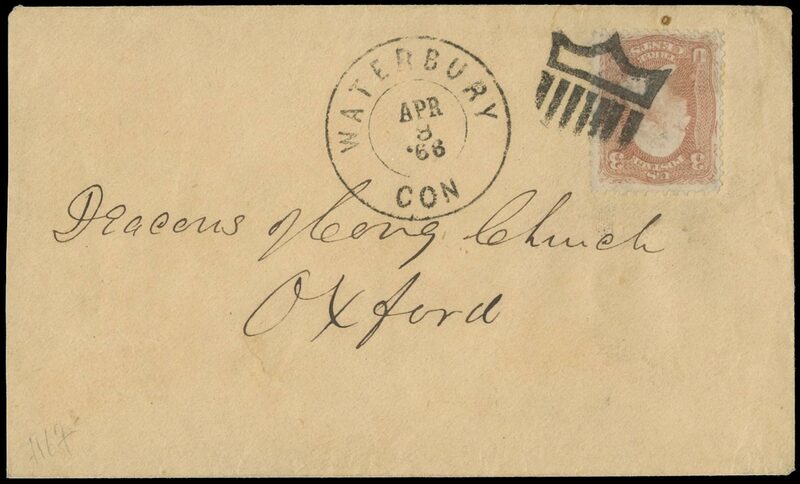 Fancy Running Fox (S-E PA-D 6) excellent strike of this extremely scarce cancel ties 3c Rose (65) on cover addressed to Watertown, CT., cover with minor spotting from handling over the years; a Fine cover; Ex-Edward S. Knapp (1942) and Dr. John Robertson (private sale 1994)rnThis is one of the scarcer fancy cancels from Connecticut. 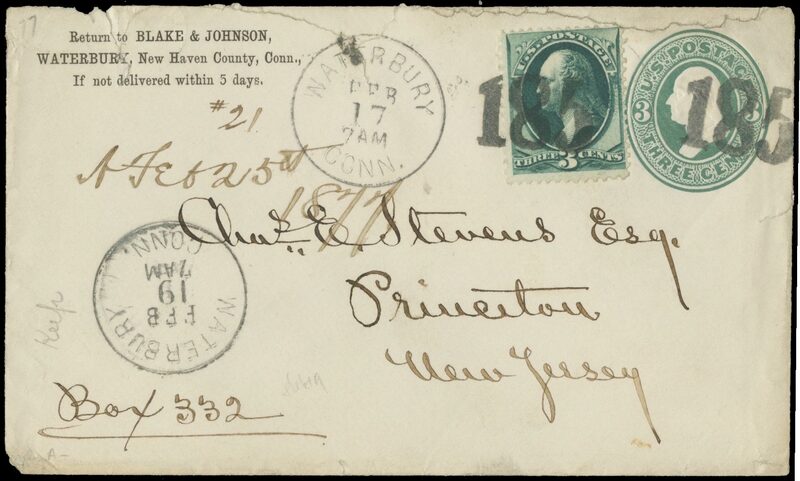 A 2016 census records only 11 examples on cover of the cancel with the fox running to the right. 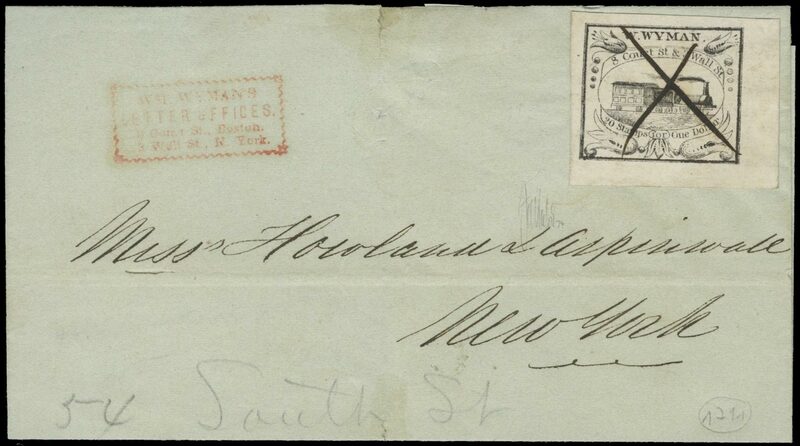 Dog’s Head (Rohloff A-04) superb strike of eye catching cancel ties 3c Rose (65, natural straight edge at right) on cover addressed to South Britain, Conn, matching double circle Jan 17 »66 date stamp to the left of the cancel, cover with small water spot at top center just touches the date stamp and stamp with minor flaws otherwise Very Fine; Ex-Ms. Kattherine Matthies, Henry W. Houser, John R. Boker, Jr.rnThe Crowe census records only 7 examples of this cancel on cover used between Jan 9 and Jan 23 1866, Rohloff felt that not more than 8 covers existed. 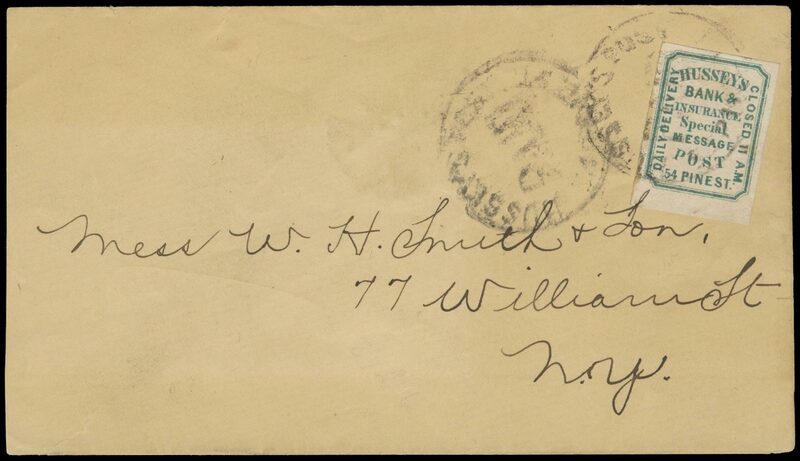 Eagle and Shield (Rohloff A-8, Type 2) well struck cancel and matching double circle Jan 15 »66 date stamp tie 3c Rose (65) on cover addressed to NY City, cover with trivial water spotting at right, otherwise Very Fine, Ex-Dr. Glen Jackson, John R. Boker, Jr.rnThe Crowe census records only 6 examples of this difficult cancellation on cover used between Jan 11 and Jan 15 1866, Rohloff felt that not more than 5 covers existed. 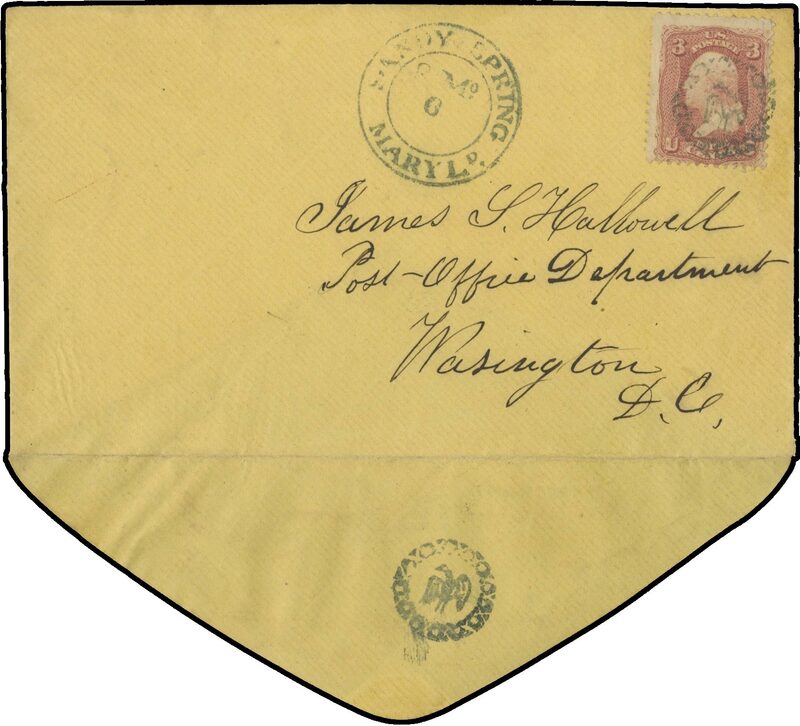 Duck on Water (Rohloff A-10) excellent full strike ties 3c Rose (65) on buff cover with matching Sep 21 »67 date stamp, addressed to Naugatuck Conn, double circle F. L. Allen handstamped return address at UL, cover with tear at top left which just touches corner card, otherwise Very Fine; Ex-Mattatuck Historical Society, Paul C. Rohloff, Gordon Eubanks, John R. Boker, Jr.rnThe Crowe census records on 3 examples of this cancel on cover used between Spet 21 and Sept 24 1867, Rohloff thought that not more 5 covers existed. 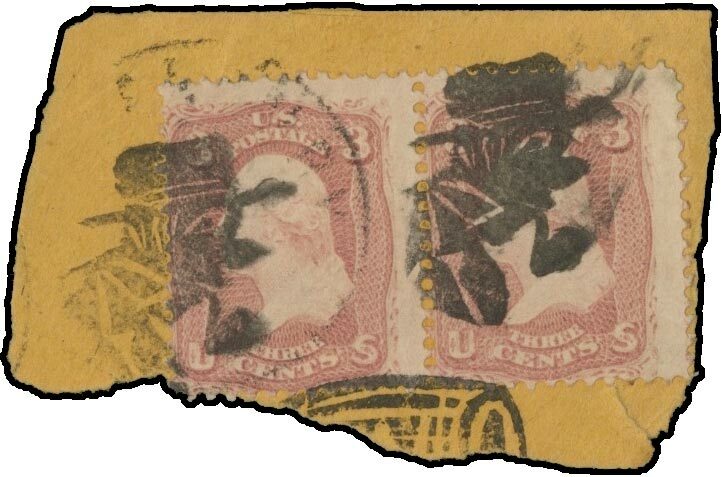 Illustrated in Rohloff book as figure 11. 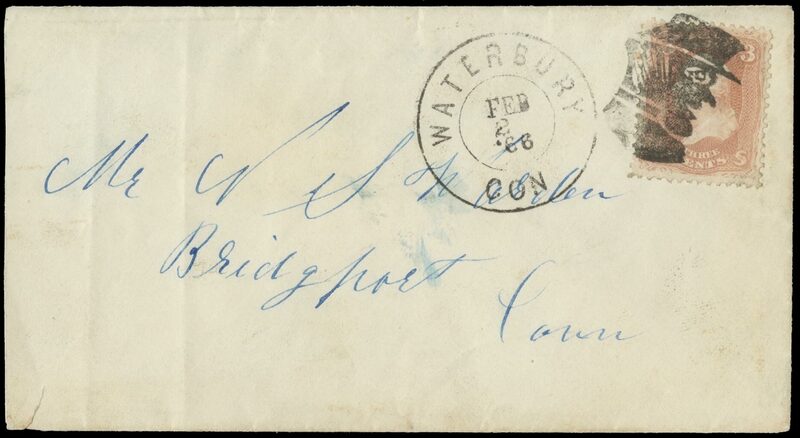 Fish (Rohloff A-12) bold strike ties 3c Rose (65) on cover, matching double circle Au 18 »66 date stamp, addressed to Oxford Conn, cover opened irregularly at right and has a small cover corner repair at lower right, still a Fine example; Ex-Mattatuck Historical Society, Dr. John Robertson, John R. Boker, Jr. rnThe Crowe census records only 11 examples of this cancel on cover used between August 16 and August 31 1866, Rohloff thought that not more than five covers existed. 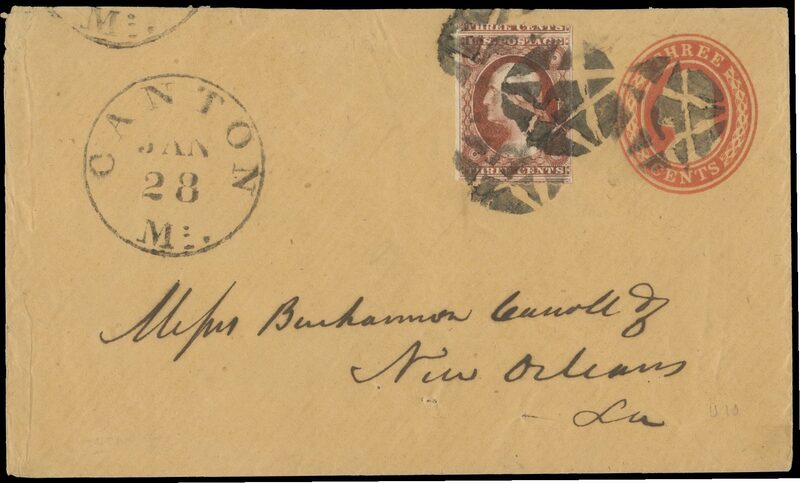 Large Bee (Rohloff A-13) choice strike cancels 3c 1869 (Scott 114) on cover addressed to Aiken, South Carolina, Waterbury Mar 18 date stamp to left of stamp. 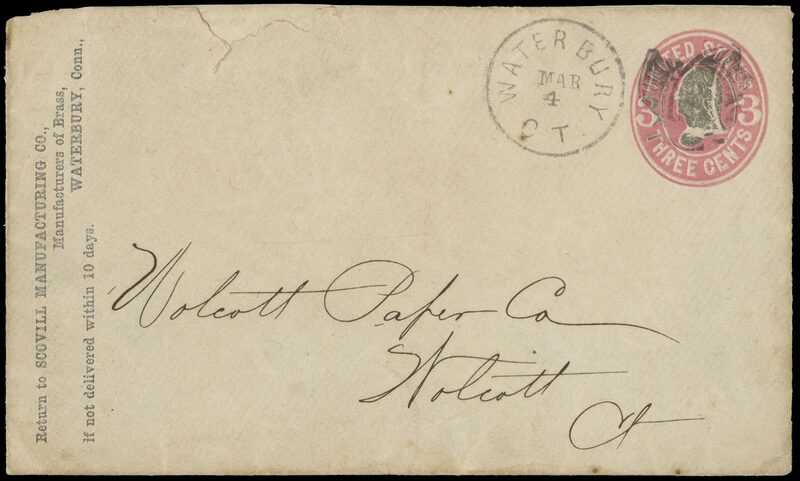 an Extremely Fine cover; Philatelic Foundation certificate 259522 states that it is a genuine usage, but is not enclosed, ex-John R. Boker, Jr.rnThis cancel was only used between March 12 and March 31 1870. 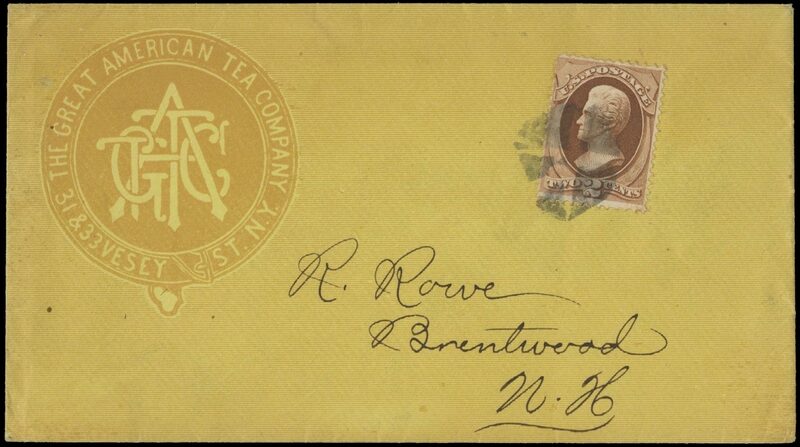 The Crowe census records 8 examples on cover, Rohloff felt not more than 8 covers existed. 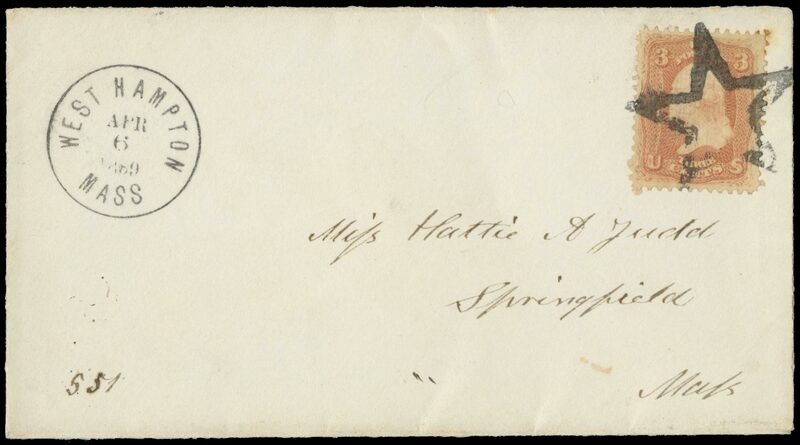 Man Smoking Pipe (Rohloff E-1, Type I) two bold strikes tie a pair of 3c Rose (Scott 65) to a small piece which shows an additional strike of a cancellation similar to Rohloff O-1 (barrel, but there are some differences), Extremely Fine piece as it is very difficult to find strikes as nice as this..rnCovers with this cancel are extremely scarce as the Crowe census has only recorded 10 examples on cover and Rohloff estimated that there were not more than 8 covers in existence. 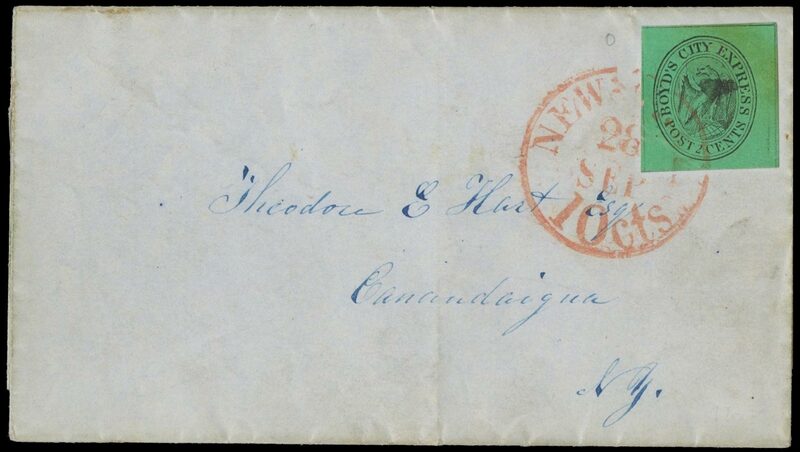 This cancel is rarely found in any off cover fancy cancel collection. 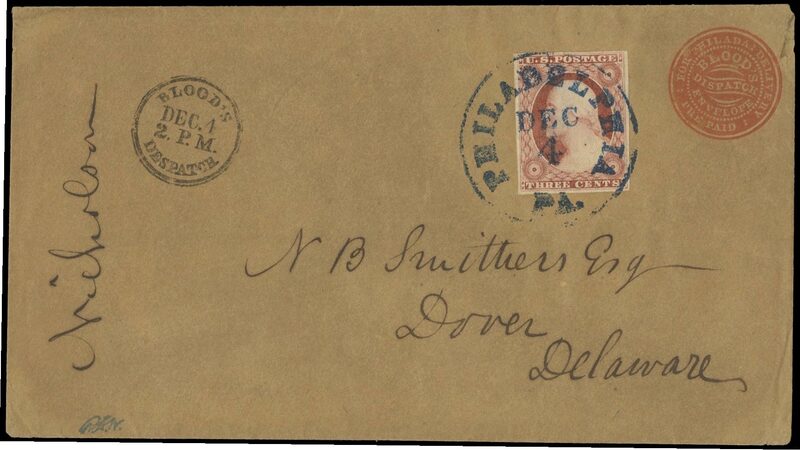 Soldier’s Head (Rohloff E-3) excellent strike ties 3c Rose (65) on cover addressed to Bridgeport Conn, matching double circle Feb 2 »66 date stamp, cover with light fold at the left not affecting the postmark or the adhesive, otherwise Extremely Fine; Ex-Mattatuck Historical Society, Paul C. Rohloff, Gordon Eubanks, John R. Boker, Jr.rnThe Crowe census records only 4 examples of this cancellation on cover used between Feb 2 and Feb 13 1866, Rohloff felt that not more than 5 examples on cover existed. 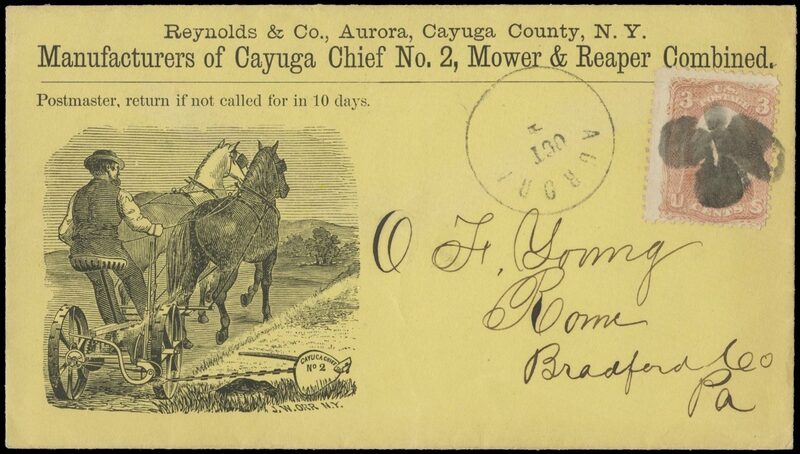 Illustrated in the Rohloff book as figure 71. 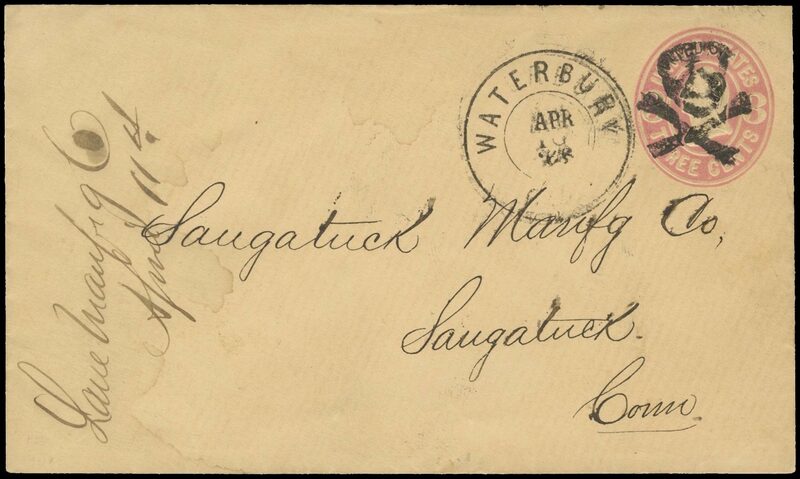 Woman in Bonnet, Facing Right (Rohloff E-10) nice strike cancels FRONT ONLY 3c Pink on white entire (U58) addressed to Wolcott Ct., matching Mar 4 date stamp, entire has been rebacked to appear as a complete cover, small cover tears at top left, Fine appearance; Ex-Paul C. Rohloff, Gordon Eubanks, John R. Boker, Jr.rnThe Crowe census records only 12 examples of this cancellation on covers used between March 3 and March 17 1870, Rohloff felt that not more than 8 examples of this cancel existed on cover. 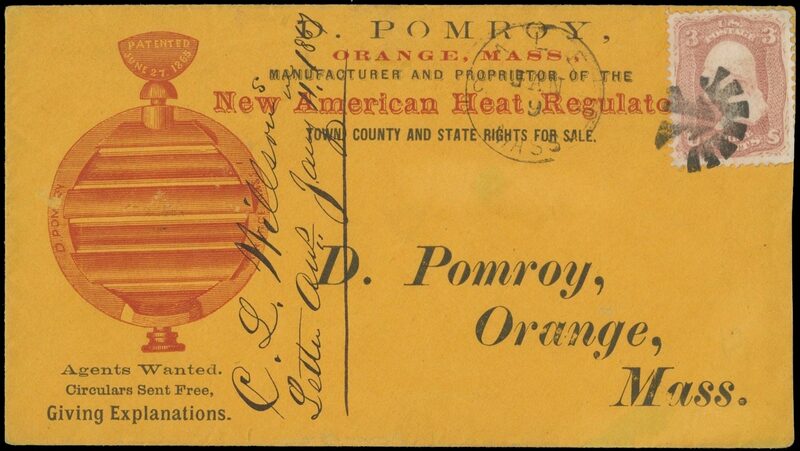 Pumpkin (Rohloff G-2) excellent strike and matching Jul 24 date stamp tie 3c Red «F» grill (94) on cover addressed to Castleton VT, cover with trivial soiling and stamp with minor perf flaws, otherwise Very Fine; an excellent example of this popular cancellation; Ex-Paul C. Rohloff, Gordon Eubanks, John R. Boker, Jr.rnThe Crowe census records 32 examples of this cancel used between July 3 and July 22 1869, Rohloff felt that not more than 15 examples of this cancel existed on cover. 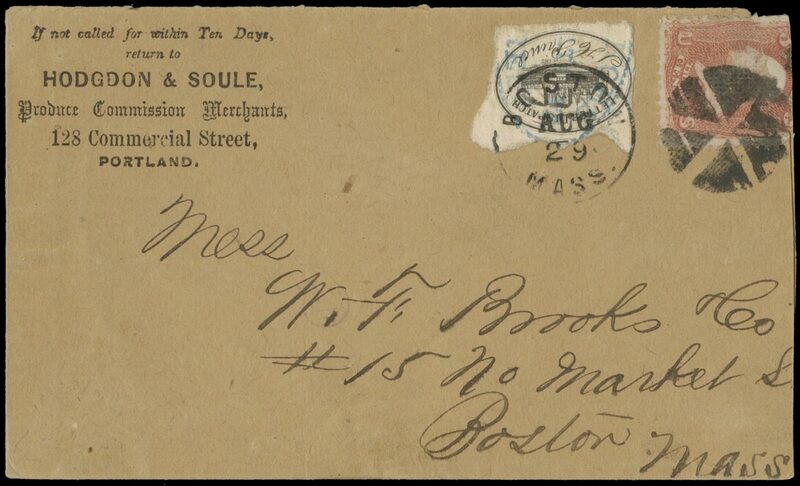 Pear (Rohloff G-3) two separate strikes of this rare cancellation tie a horizontal pair of the 3c Rose (Scott 65) on cover addressed to Blackstone, Mass., lightly struck double circle Waterbury, Con Oct 14, 67 date stamp to the left of the pair, cover slightly reduced with a tear away from the date stamp and a toning band which just touches the postmark, but does not affect the stamp, a Fine examplernThis is the only example of a Waterbury Pear cancellation on cover recorded in the Crowe census, though Rohloff estimates that there may be as many as five covers, illustrated in the Rohloff book as figure 103. 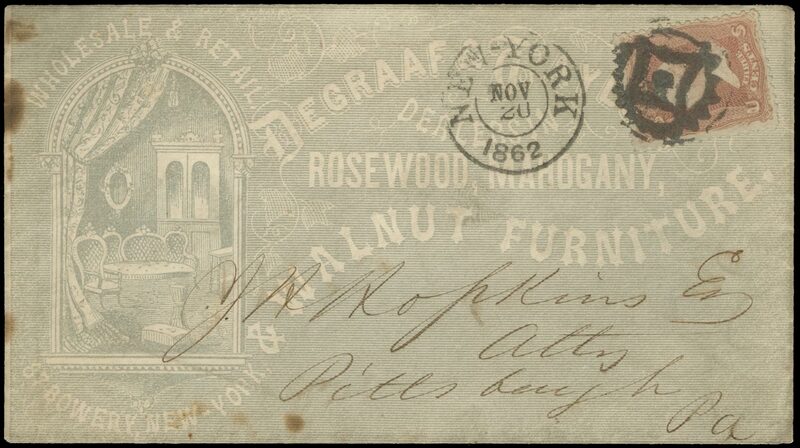 Acorn (Rohloff G-4) nice strike of this intricate cancellation ties 3c 1869 (114) on Scovill House corner card addressed to Middletown Conn, light strike of matching Mar 3 date stamp, Very Fine; Ex-Edward S. Knapp, Dr. John Robertson, John R. Boker, Jr.rnThe Crowe census records only 10 examples of this cancel on cover, used between Feb 23 and March 3 1870, Rohloff felt that not more than 5 examples on cover existed. 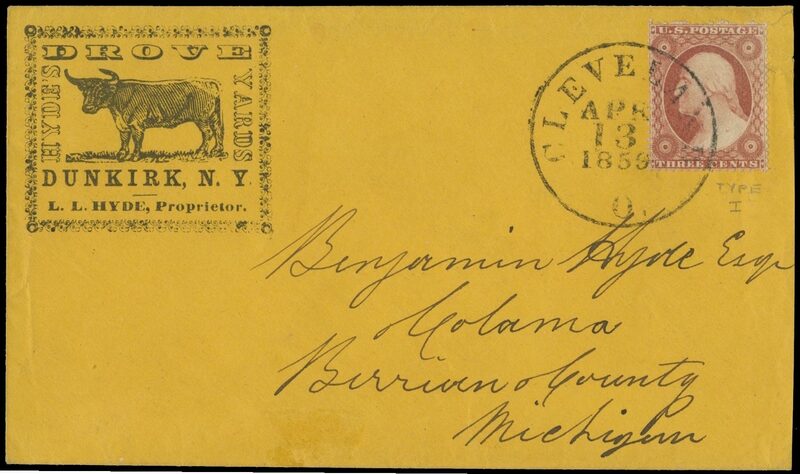 Heart with Arrow Pointing Down to Right (Rohloff J-5, Type 1) bold sock-on-the nose strike cancels 3c Green (National printing, Scott 147), matching rimless Waterbury CT Feb 15 date stamp to the left, on cover addressed to Brooklyn NY, cover missing the lower right corner, otherwise Very Fine; PSE certificate 16439 which is not included, Ex-John R. Boker, Jr.rnThe Crowe census records 10 examples of this cancellation on cover, Rohloff estimated that only 5 existed, used only between Feb 14-15 in 1871. 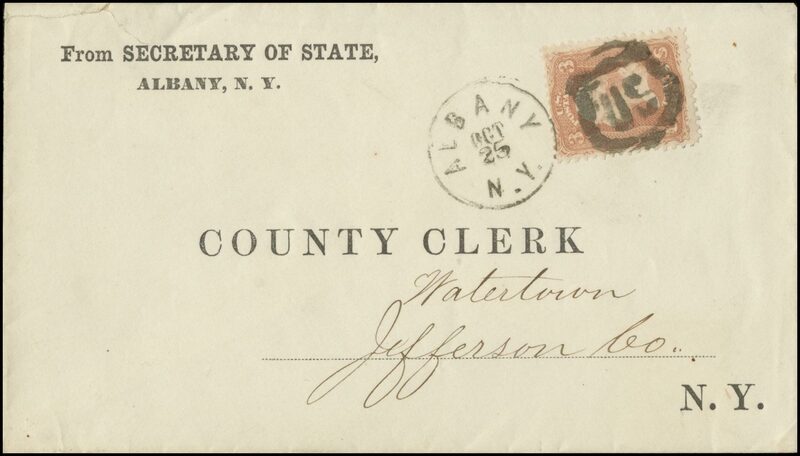 Heart with Arrow Pointing Down to the Right (Rohloff J-5, Type 1) excellent strike and matching Feb 14 date stamp tie 3c 1869 (114) on cover addressed to Plainville Conn, trivial gum toning around stamp, otherwise Extremely Fine; Ex-John R. Boker, Jr.rnThe Crowe census records only 10 examples of this cancel on covers used between Feb 14 and Feb 15 1871, Rohloff felt that not more than 5 examples of this cancel existed on cover. 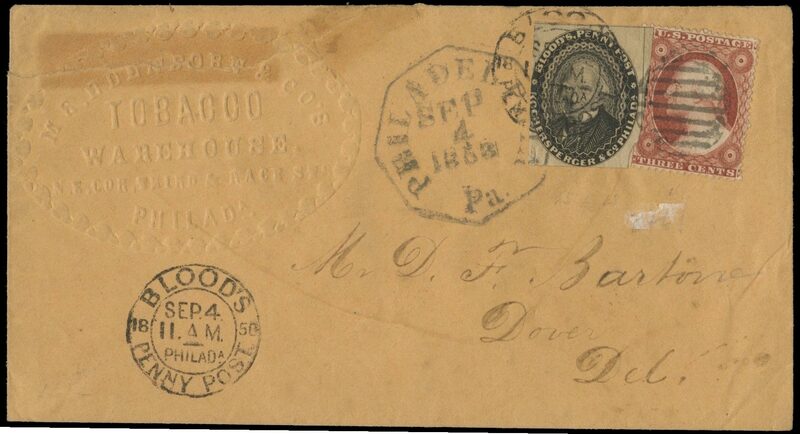 Circle of Five Hears Enclosing a Star (Rohloff J-10 and S-4) excellent strike and matching double circle Oct 21 »67 date stamp tie 3c Rose (65) on cover addressed to Blackstone, Mass, Extremely Fine cover. 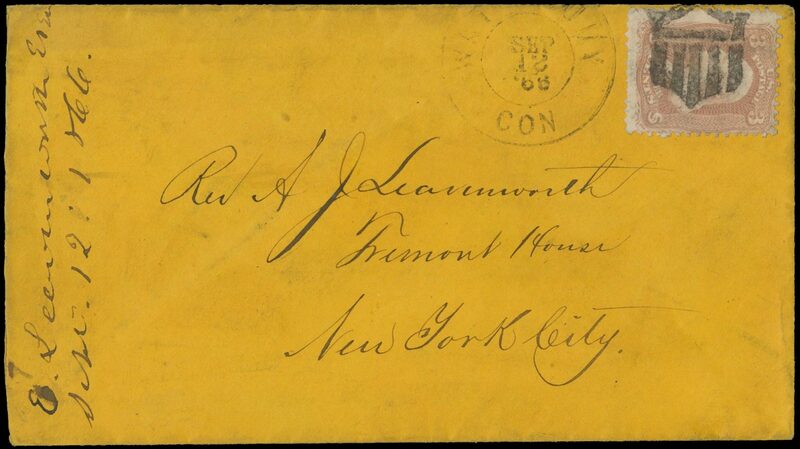 Ex-John R. Boker, Jr.rnThe Crowe census records only 11 examples of this cancel on covers used between March 7 and Oct 26 1867, Rohloff felt that not more than 8 examples on cover exist. 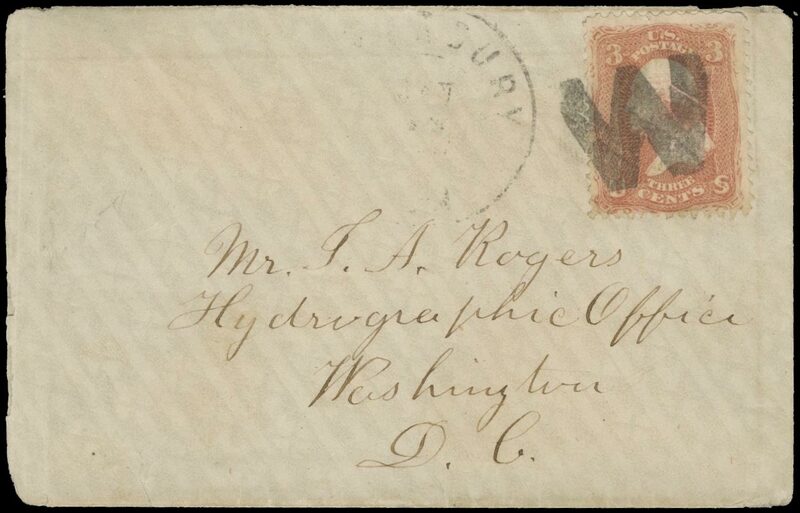 Initial “W”, Sans Serif (Rohloff K-12, Type 1) excellent strike ties 3c Red «F» grill (94) on cover addressed to Hydrographic Office, Washington DC, very light strike of date stamp at center, otherwise Very Fine; Ex-Paul C. Rohloff, Gordon Eubanks, John R. Boker, Jr.rnThe Crowe census records only 6 examples of this cancellation on covers used between Dec 12 1867 and May 14 1868. 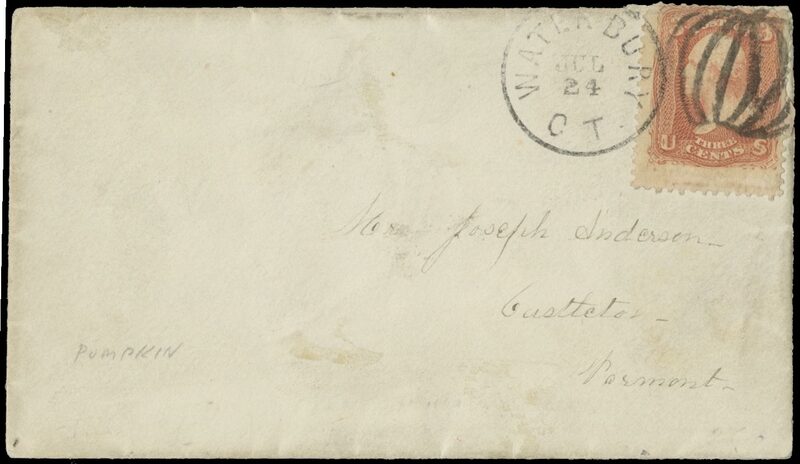 Rohloff felt that not more than 8 covers exist. 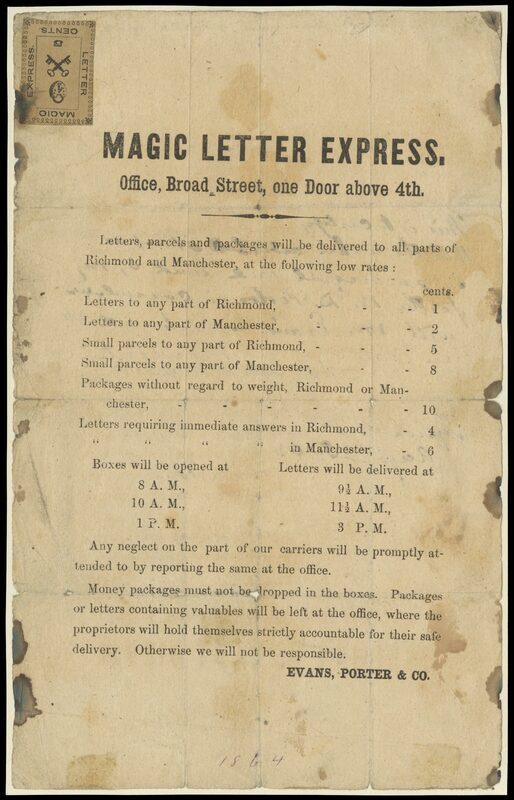 Illustrated in the Rohloff book as figure 145. 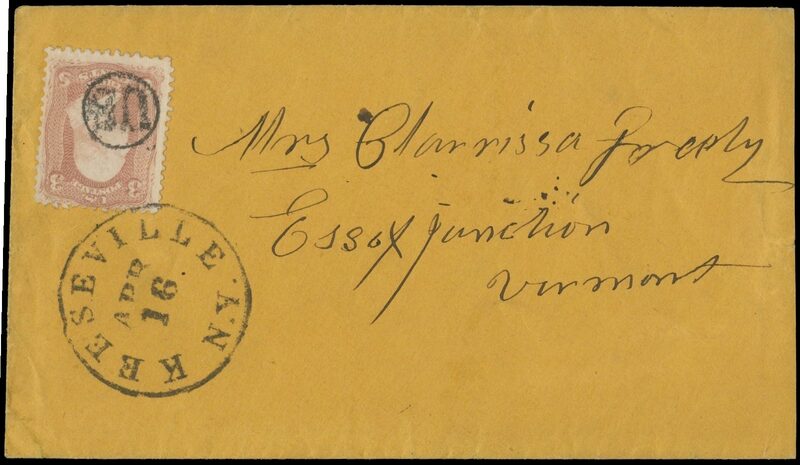 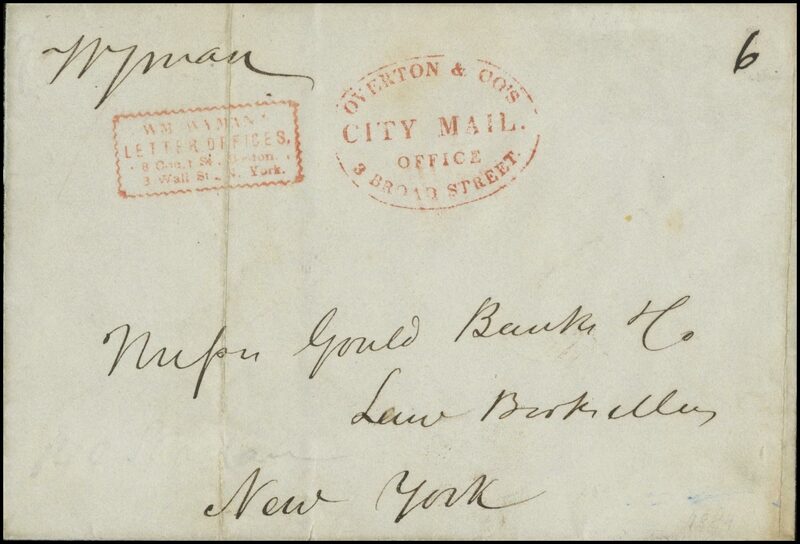 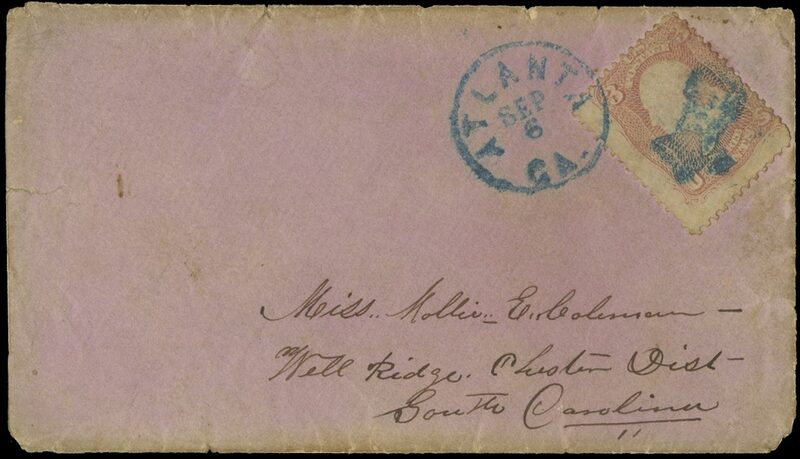 Elm Leaf (Rohloff L-1) choice strike cancels 3c Rose (65) and matching double circle Aug 10 1866 date stamp ties stamp on cover addressed to Upton Maine, Extremely Fine cover and an excellent example of this intricate cancel; Ex-Paul C. Rohloff, Gordon Eubanks, John R. Broker, Jr.rnThe Crowe census records 28 examples of this cancel used on covers between July 20 and Aug 16 1866, Rohloff felt that not more than 15 examples on cover exist. 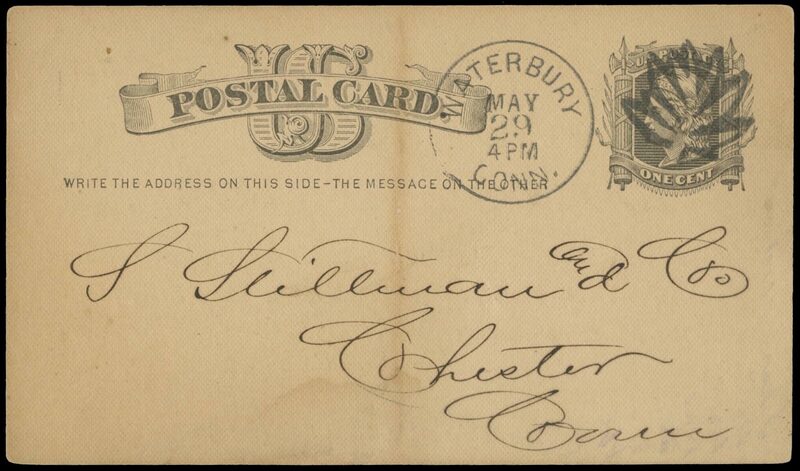 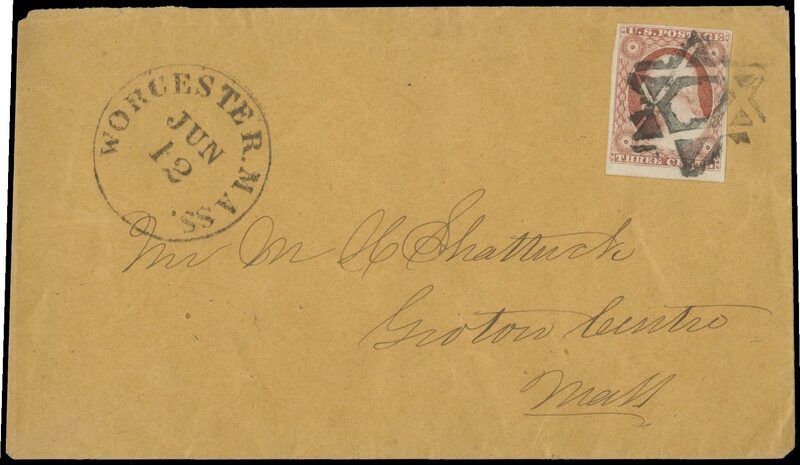 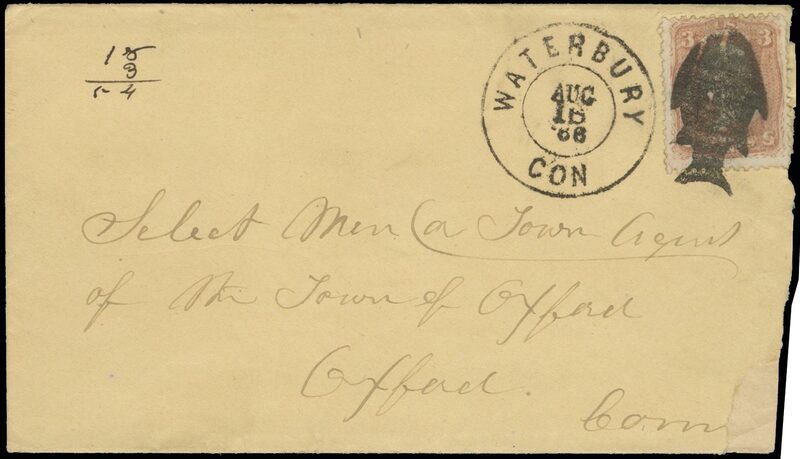 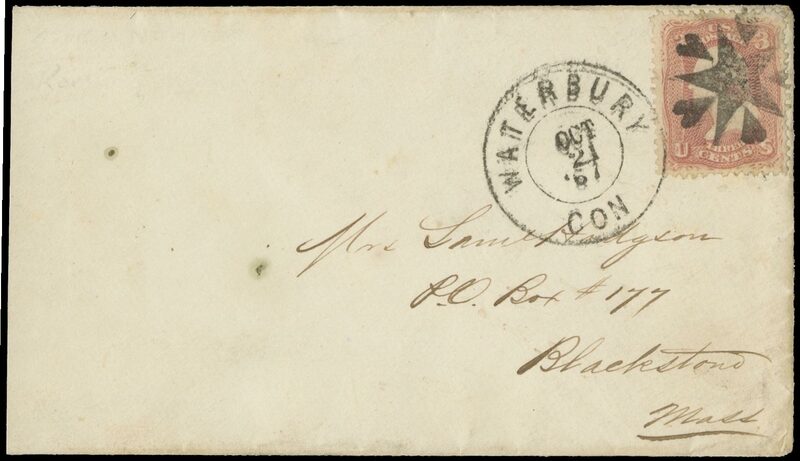 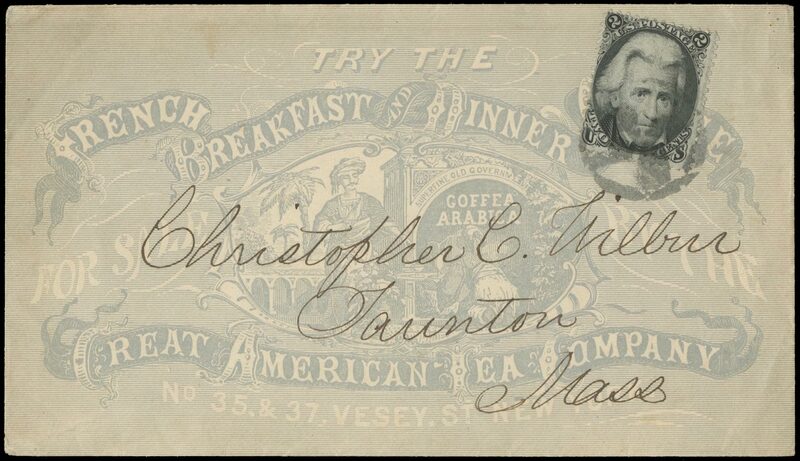 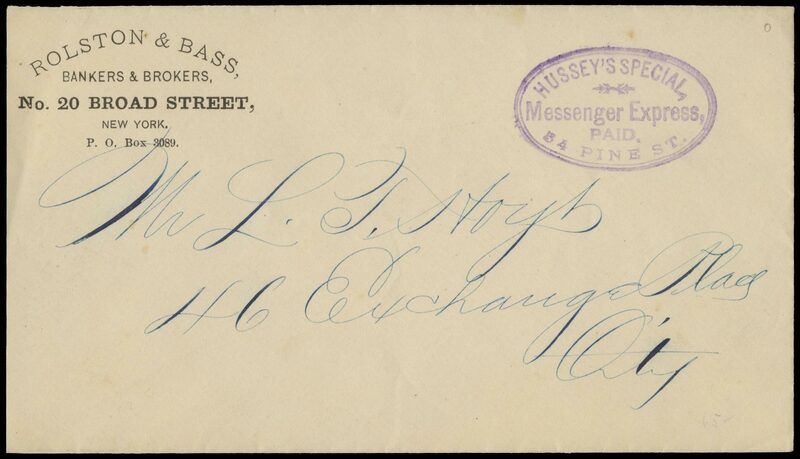 Maple Leaf (Rohloff L-10, Type 5) excellent strike cancels 1c postal card (UX5) addressed to Chester Conn, matching Waterbury Conn. May 29 (1878) postmark at left. 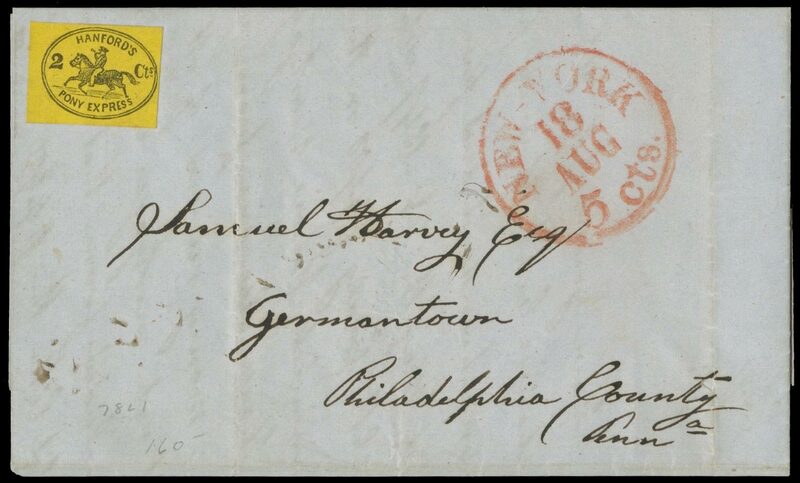 ; card with light toning band at center, otherwise Very Fine; 1990 PF certificate; Ex-Henry W. HouserrnThe Crowe census records 19 examples of this cancel on covers used between Jan 21 and Jun 28 1878. 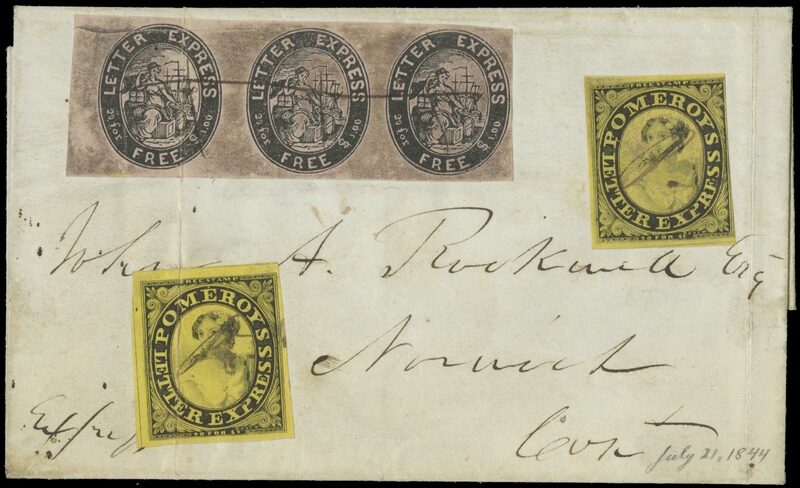 Rohloff estimated that not more than 8 examples on cover existed. 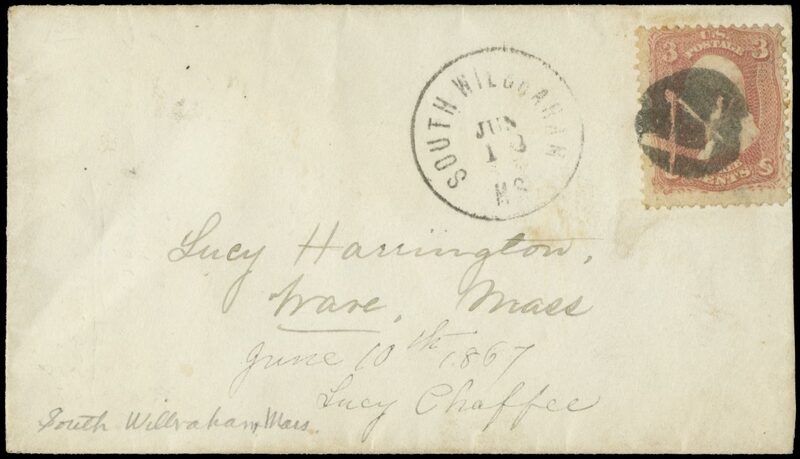 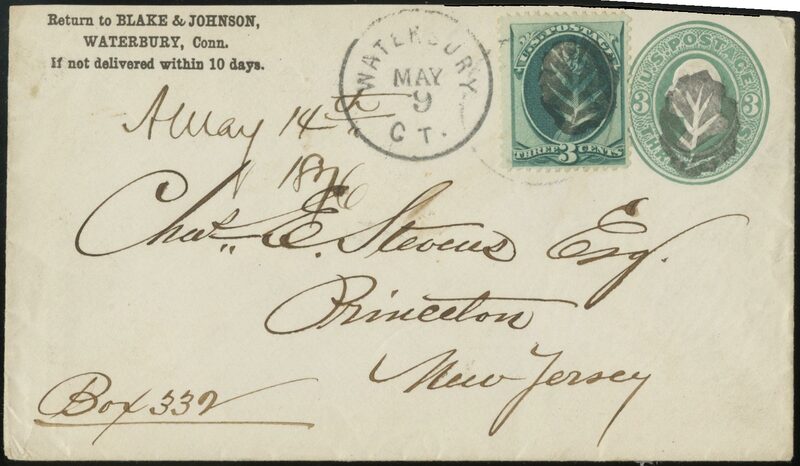 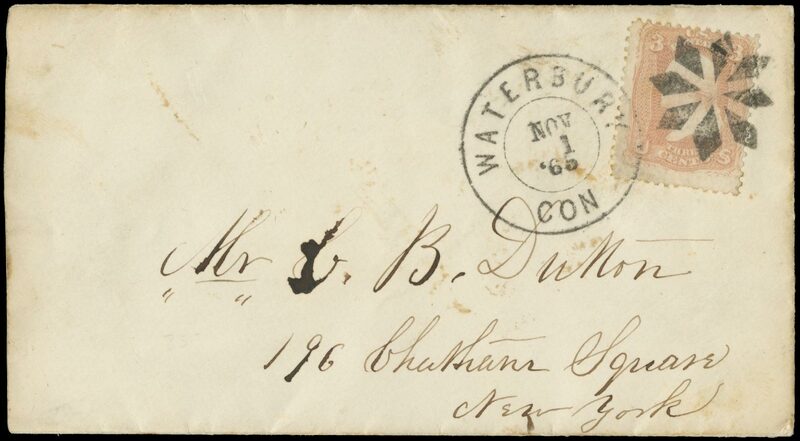 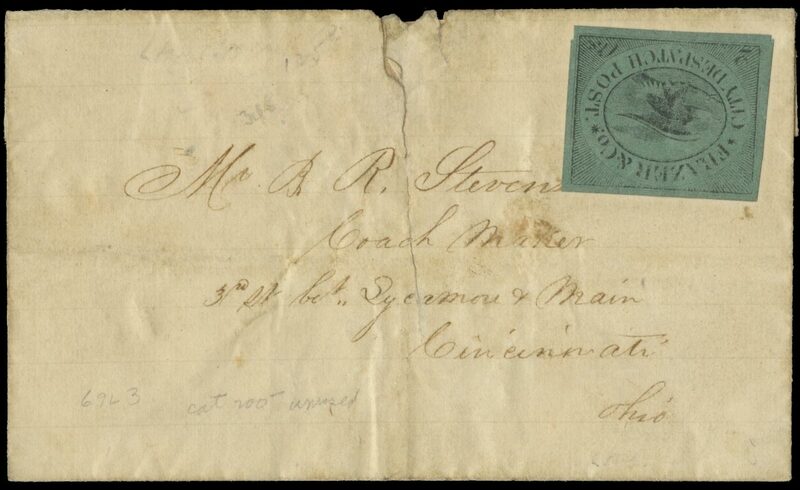 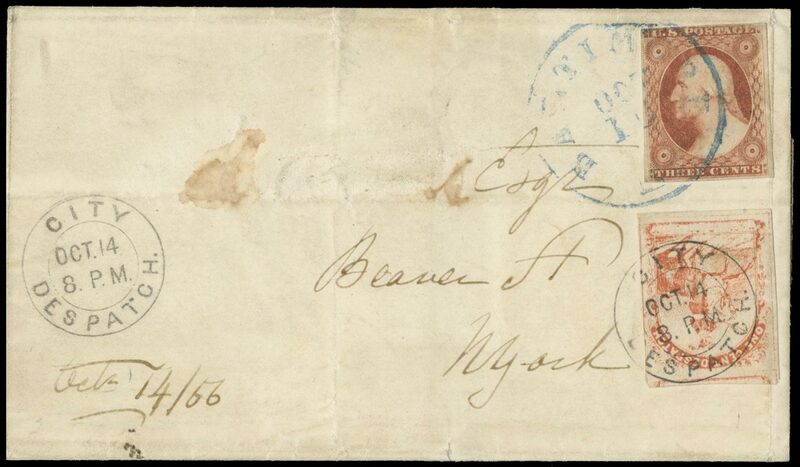 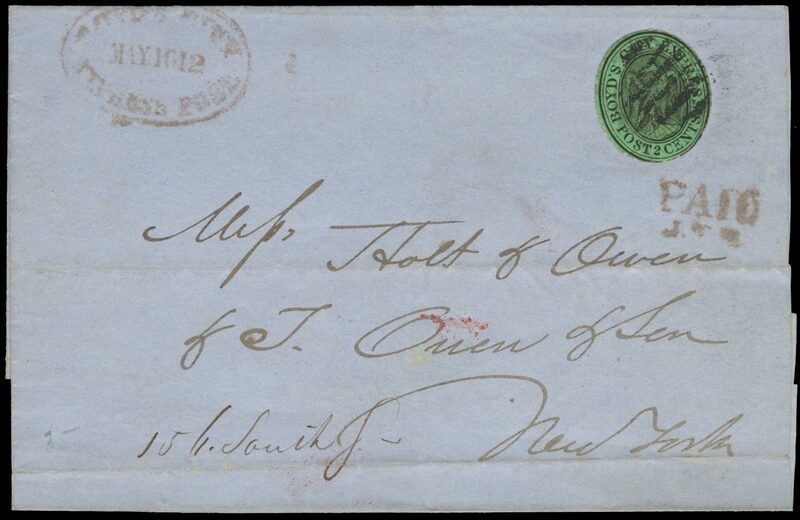 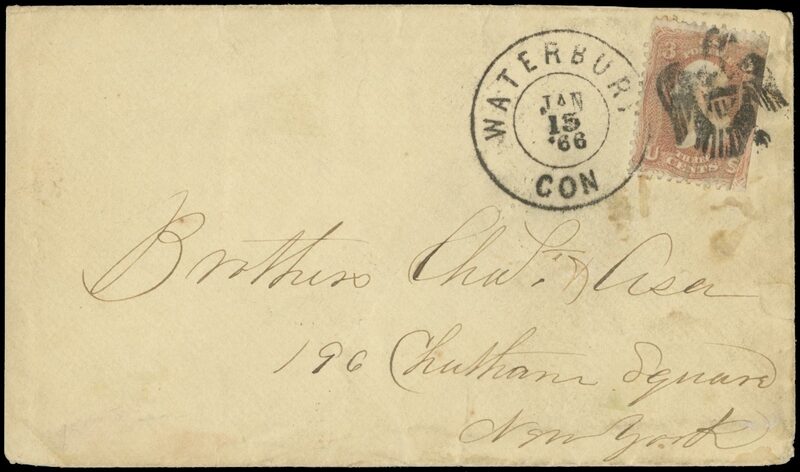 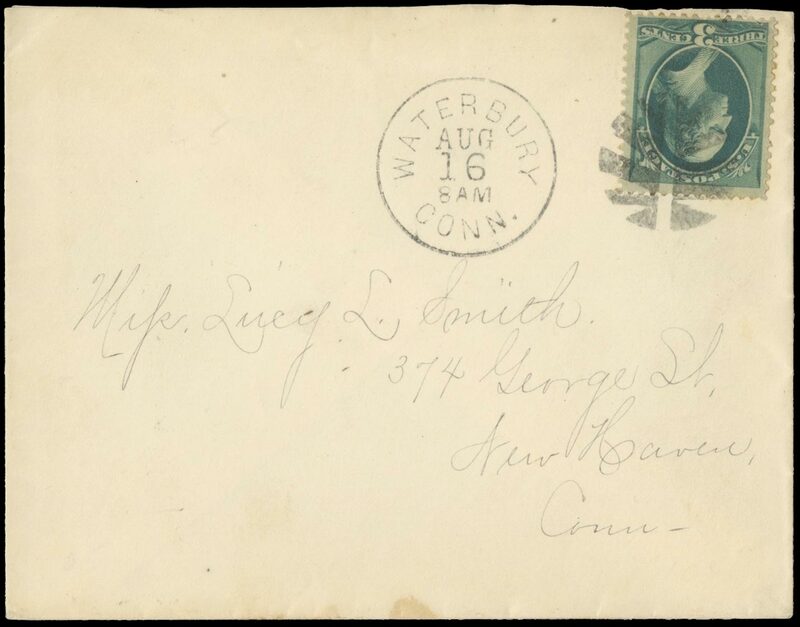 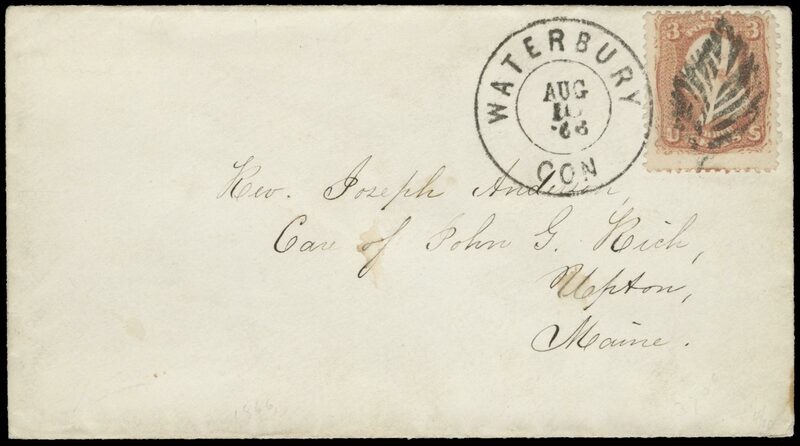 Stylized Leaf, 10 Segments (Rohloff L-37, Type 6) excellent strike ties 3c Green (184) on cover addressed to New Haven, Conn, matching Aug 16 date stamp. 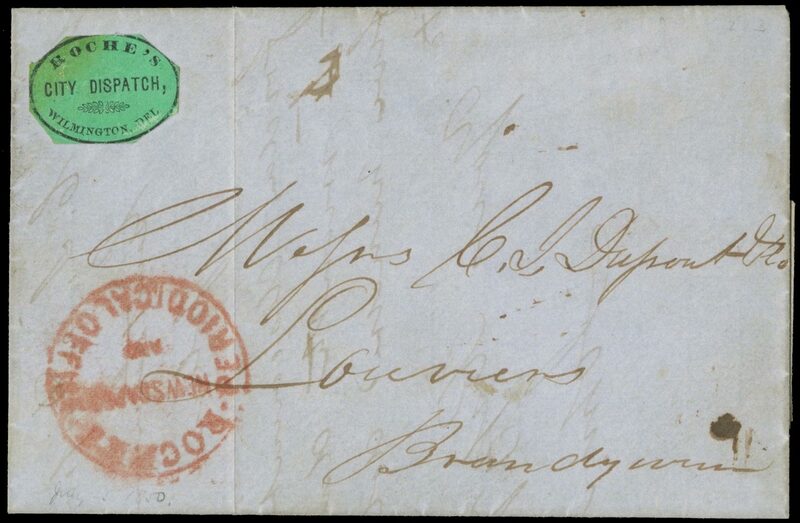 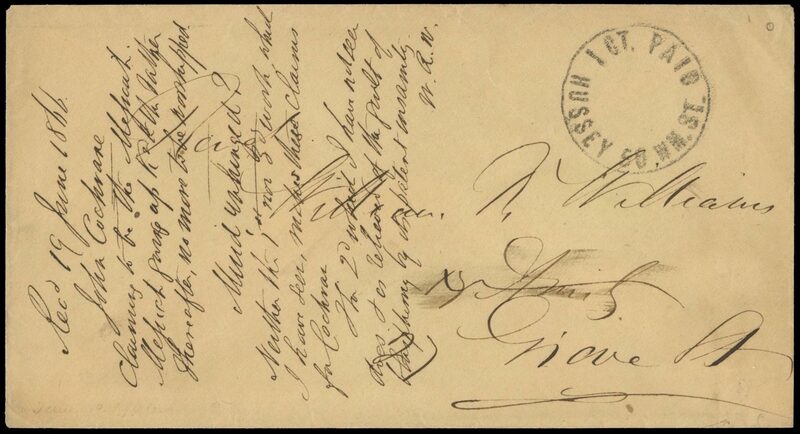 Extremely Fine cover.rnThe Crowe census records only 3 examples of this cancel on covers used between May 12 and Oct 12 1881, Rohloff felt that not more than 8 examples on cover exists. 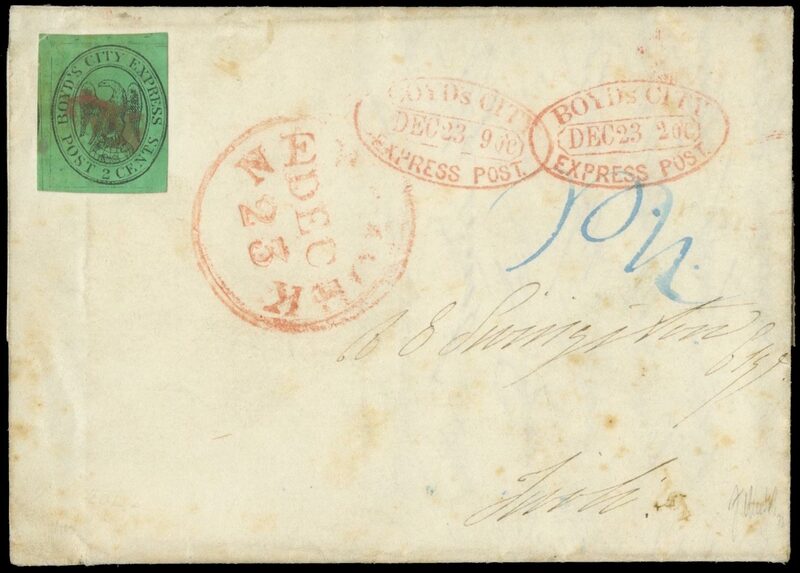 Stylized Leaf, 11 Segments (Rohloff L-41, Type 1) excellent full strike ties 3c Green (207, natural straight edge at left) on cover addressed to Huntsville Conn, matching Jan 3 date stamp, Extremely Fine cover.rnThe Crowe census records only 2 examples of this cancel on covers between Jan 3 and Aug 1 1882. 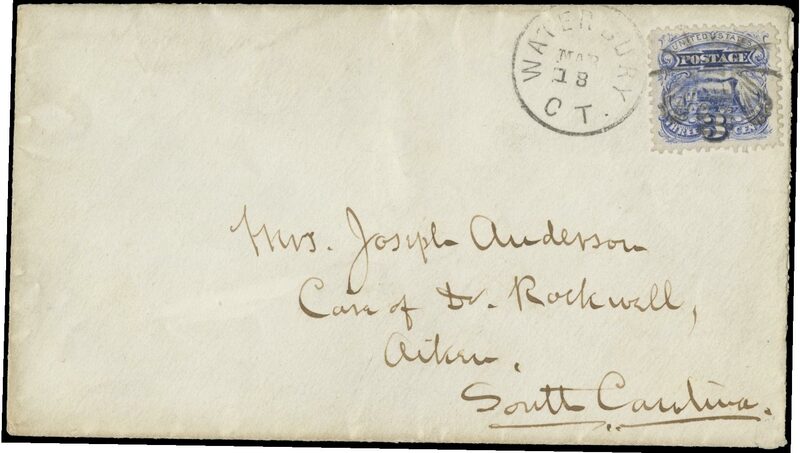 Rohloff felt that not more than 8 covers exist. 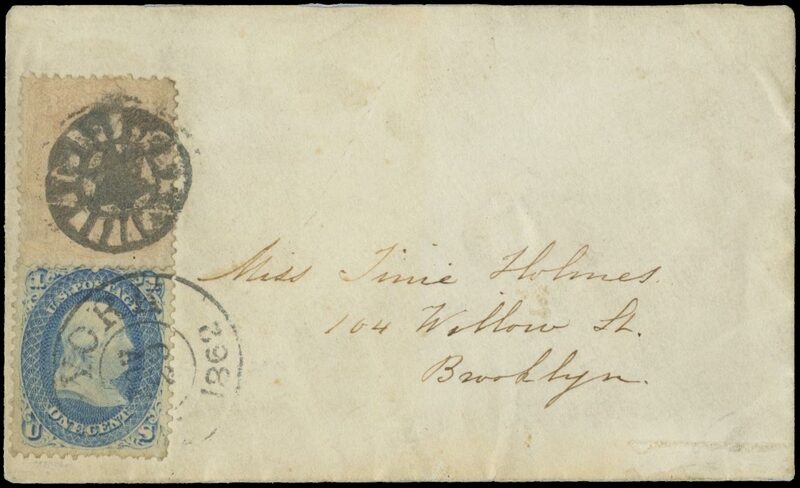 “185” (Rohloff N-6) two excellent strikes, one cancels 3¢ green on white entire (U163) and one ties 3¢ green (158) on 1877 entire addressed to Princeton NJ, matching Feb 17 date stamp; entire with some tears along the top edge from opening, one into date stamp; o/w F-VF; Ex-Dr. John Robertson, John R. Boker, Jr.rnThe Crowe census records only 5 examples of this cancel on covers used between Feb 17 and Feb 19 1877, Rohloff felt that not more than 8 covers exist. 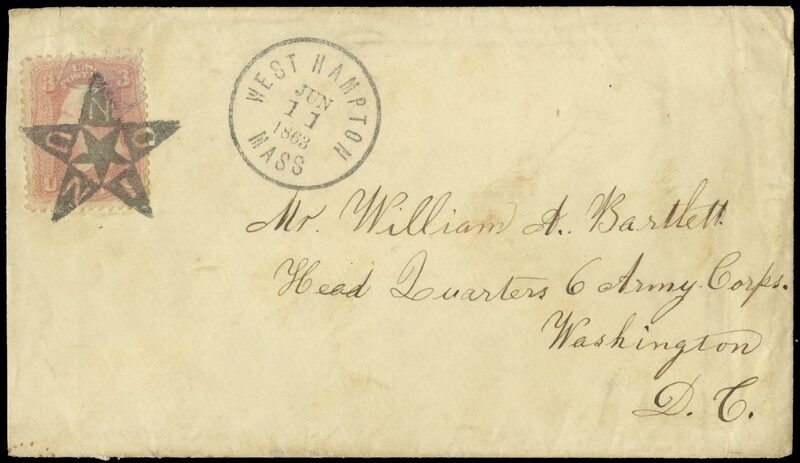 Bats, Baseball and Diamond (Rohloff O-2, Type 1) excellent strike ties 3c Rose (Scott 65) on cover addressed to Blackstone Mass, lighter strike of Waterbury double circle Sep 10 67 date stamp to the left of the cancel; small cover tear at top just passes under the stamp and with a light cover crease at the lower right; overall Very Fine; ex-Dr, John Robertson (private sale 1994), Ex-John R. Boker, Jr.rnThe Crowe census records 6 examples of this cancel on cover used between Sept 2 and Sep 10 1867. 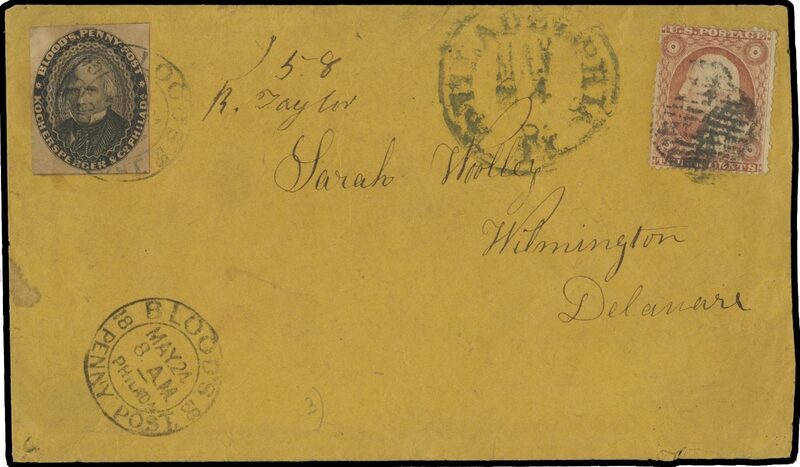 This is the latest recorded usage of this cancel. 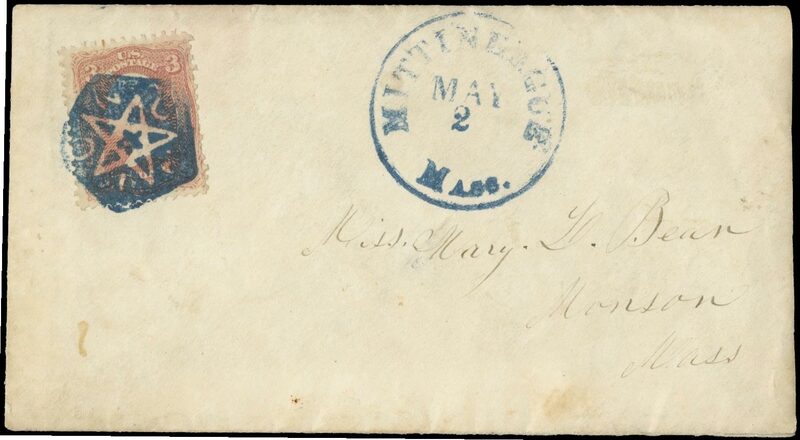 Buttonless Shoe (Congress Gaiter) (Rohloff O-12) excellent strike and matching Mar 26 date stamp tied 3c 1869 (114) on cover addressed to Aiken SC. 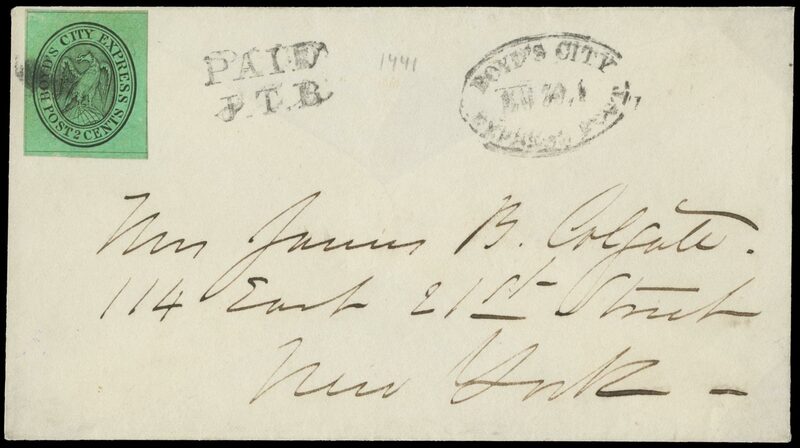 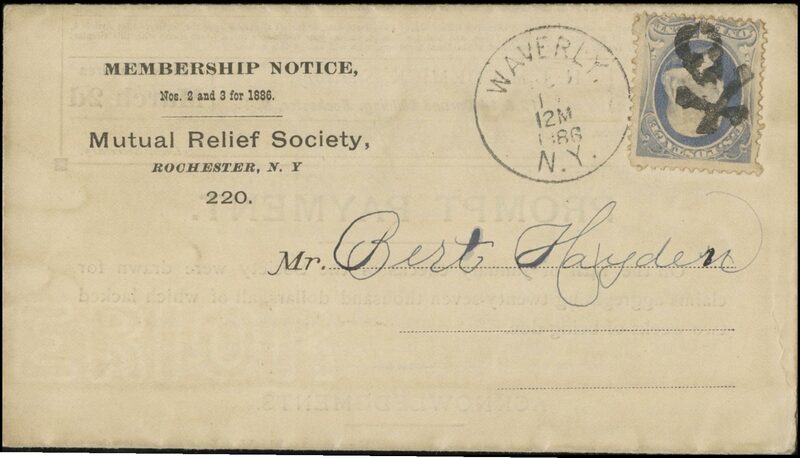 Extremely Fine; Ex-Edward S. Knapp, William L. Moody, John R. Boker, Jr.rnThe Crowe census records twelve examples of this cancel on covers used between March 19 and March 26 1870. 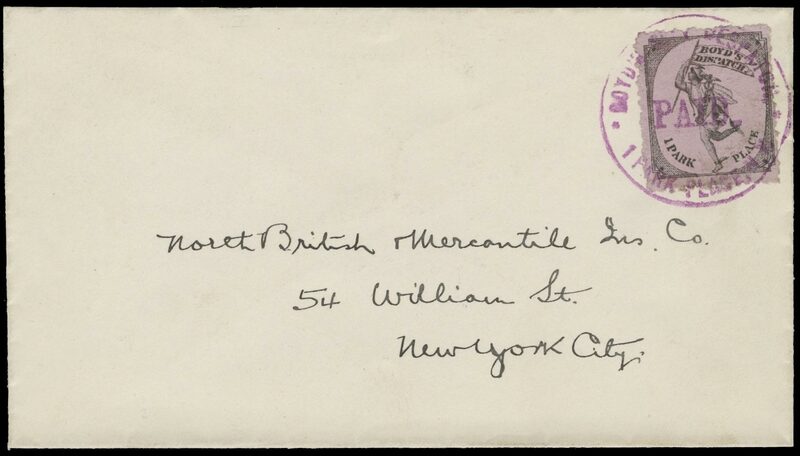 Rosette, Eight Segments (Rohloff P-13, Type 4) excellent strike ties 3c Rose (Scott 65) on cover addressed to NY City, also tied by double circle Waterbury Con Nov 1 »65 date stamp; cover with trivial toning, otherwise Very Fine; Ex-John R. Boker, Jr. .rnThe Crowe census records 10 examples of this cancel on cover used between Nov 1 1865 and July 15 1867 making this cover the earliest recorded use of this cancel, Rohloff estimated that not more than 8 covers exist. 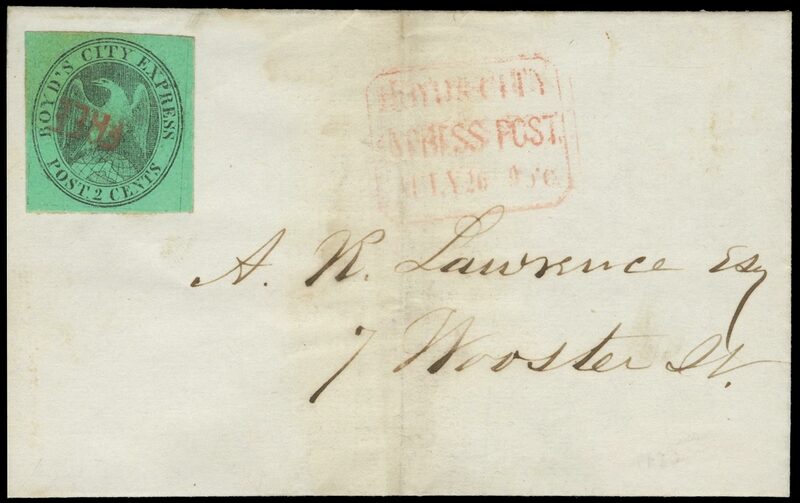 Rosette, Eight Segments (Rohloff P-19, Type 10) two covers mounted on Godden page with illustration of cancel; 1) franked with 3c Green (147) with Nov 22 date stamp and addressed to Minneapolis; 2) 3c Green on white entire (U163) with Nov 23 date stamp and addressed to Princeton, NJ, docketed 1876; an Extremely Fine pairrnThe Crowe census records 34 examples of this cancel used on covers between June 24 1875 and April 16 1883. 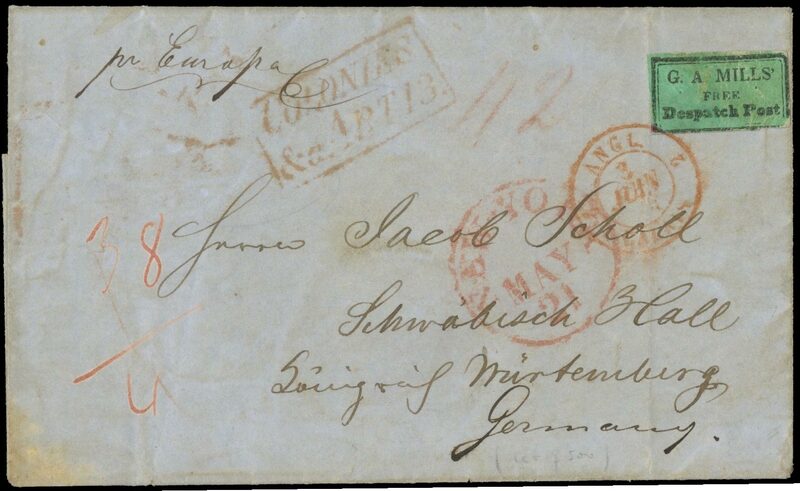 Rohloff felt that not more than 15 covers exist. 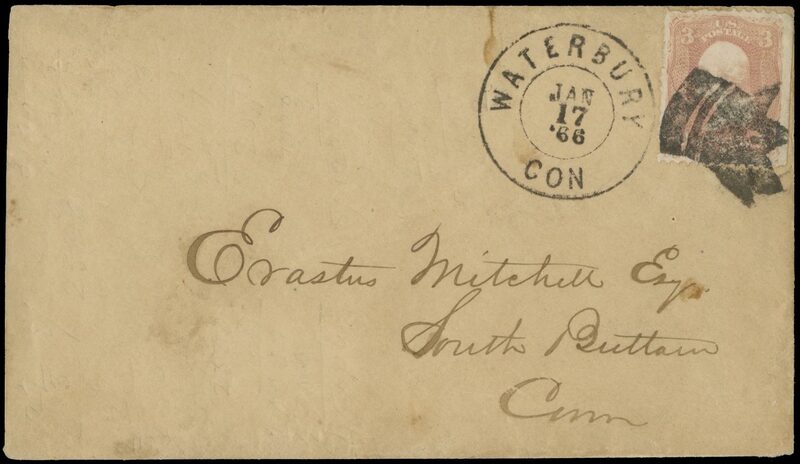 Skull and Crossbones (Rohloff R-2, Type 2) excellent strike cancels 3c Pink on buff entire (U59), addressed to Saugatuck Conn, matching Apr 10 »66 date stamp, Extremely Fine use. 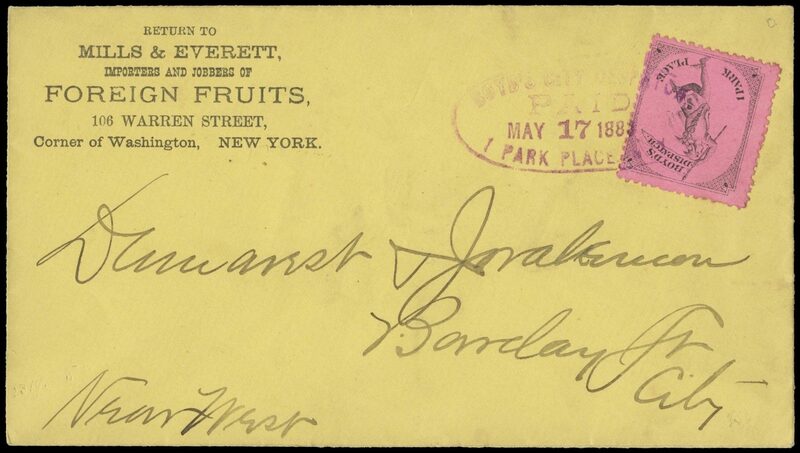 Ex- Paul C. Rohloff, Gordon Eubanks, John R. Boker, Jr.rnThe Crowe census records only 2 examples of this cancel on covers used between April 8 and April 17 1866, Rohloff felt that not more than 5 covers exist. 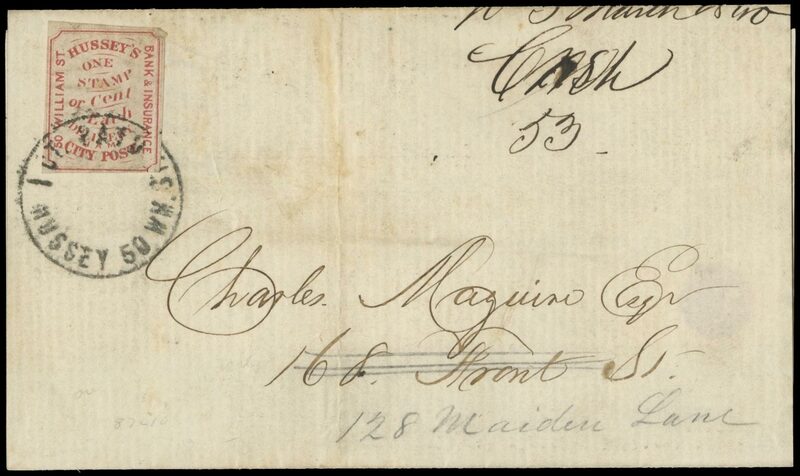 Illustrated in Rohloff book as figure 264. 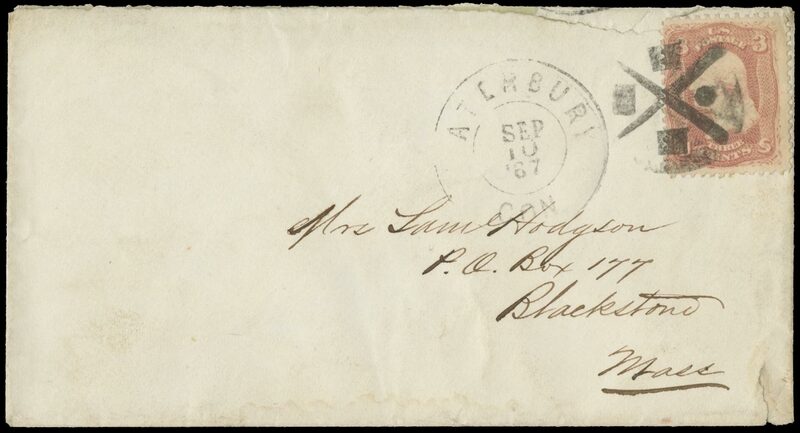 “A. 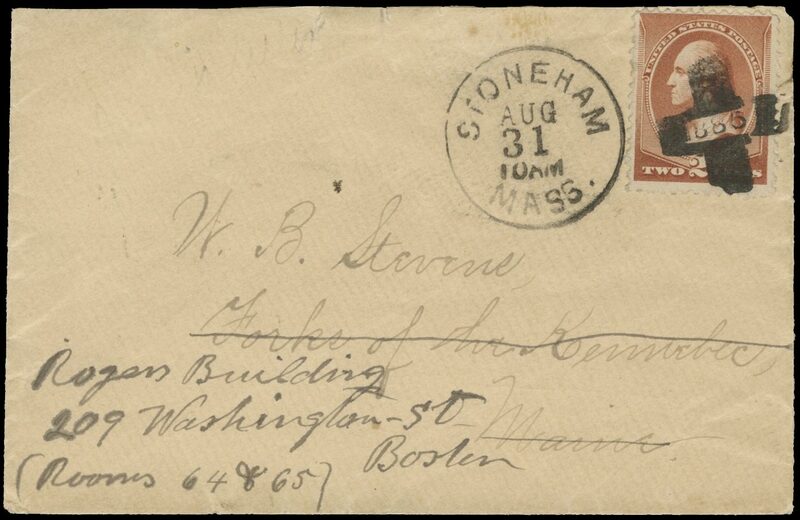 J.” on Tombstone (Rohloff R-5) excellent strike ties 3c Red «F» grill (94) on dark buff cover addressed to Leverett Mass, matching Mar. 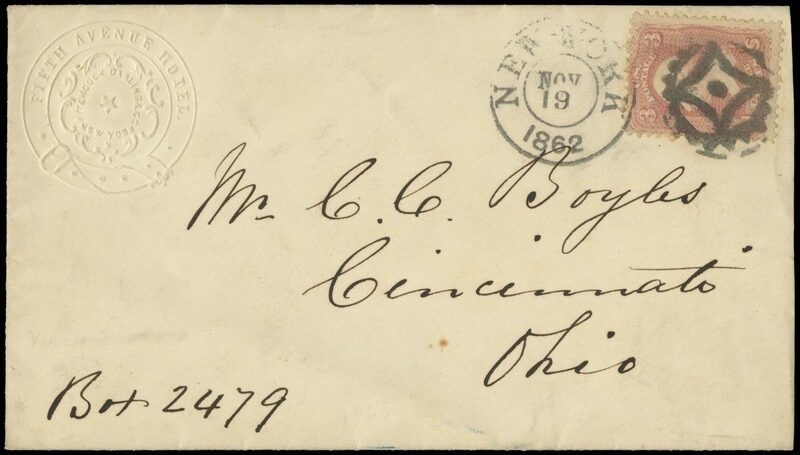 29 date stamp, adhesive with perf faults at bottom, otherwise a Very Fine use; Ex-Paul C. Rohloff, Gordon Eubanks, John R. Boker, Jr.rnThe Crowe census records only 10 examples of this cancel on covers used between March 26 and April 8 1869, Rohloff felt that only 5 covers exist. 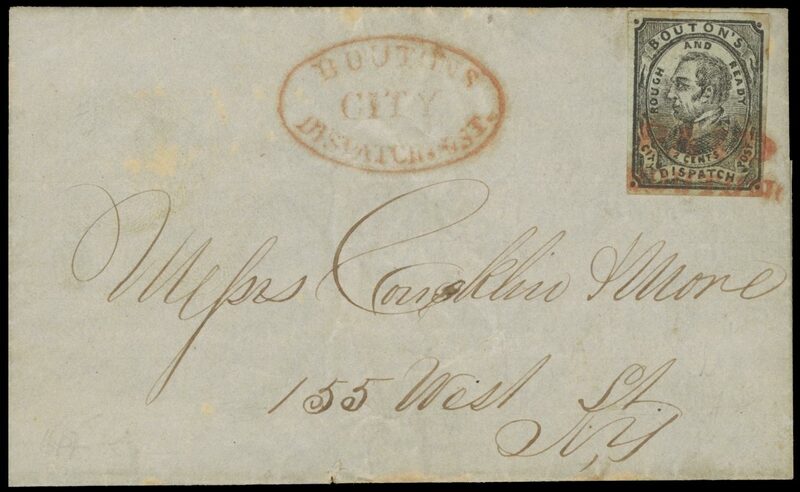 Illustrated in Rohloff as figure 267.